The Hectic Cook – Homemade food in a hurry. Its stretching it a bit to call this a recipe. Chucking some marshmallows on top of melted chocolate, whacking a Smartie on top and calling it cordon beau cooking would be slightly taking the mick. But these Top Hats represent part of my childhood. A good part. A warm fuzzy part. And having come south of Hadrian’s Wall as an adult, I’ve come to realise that they haven’t featured in a fair amount of other folk’s childhoods. Which is such a shame. I produced these for one of my lot’s parties (there haven’t been many parties, but there are lots of kids, so I’d struggle to pin down the exact moment). Chatting to the adults present, it emerged that only the Scots and the Northern Irish amongst us had come across Top Hats before. They’re clearly a Gaelic creation? So it would only be fair to share the love with others. And as they are so simple, and yet so happiness-inducing, I feel it a duty to pop these on the blog. 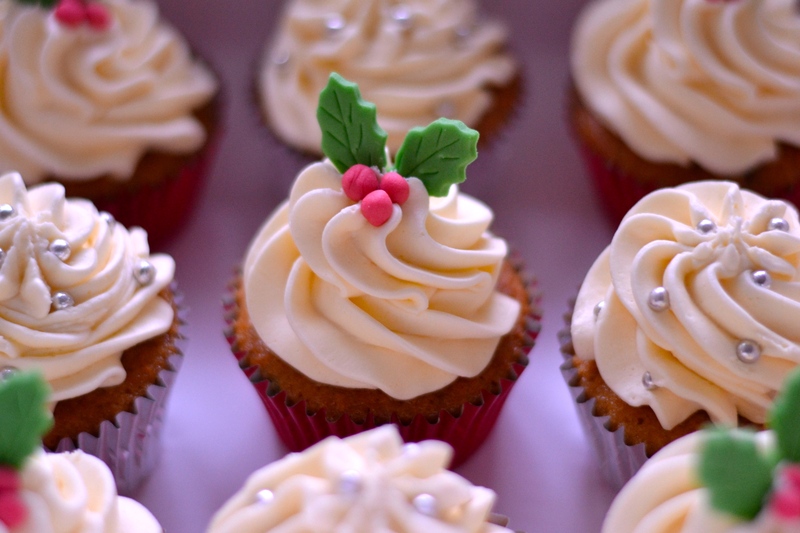 On this occasion, I made them for a cake sale at school. Its Children In Need, the theme is spotty, and by jove, my Top Hats fit the brief perfectly (apart from the whole lack of cake bit, but meh). 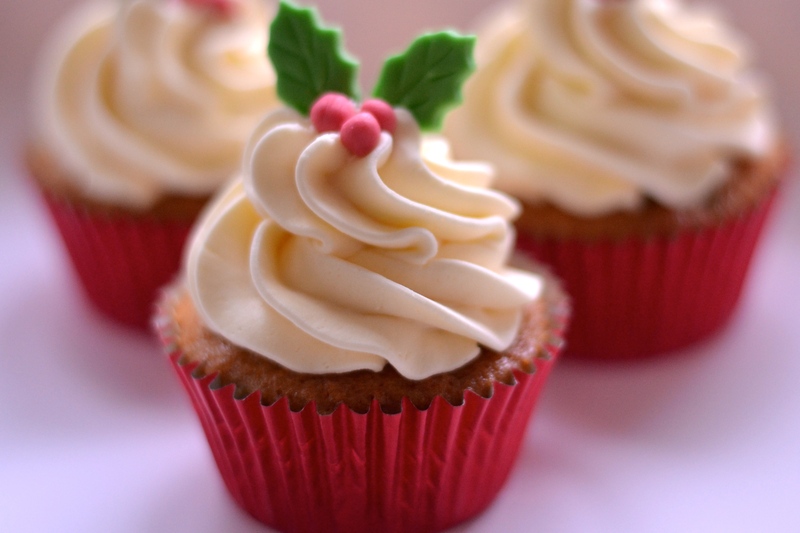 These are perfect for cake sales as they don’t take much effort to make, you can make hundreds pretty quickly if you need to, and they go down really well. 1. Spread out your cupcake cases on a tray. 2. Put the chocolate in a microwavable bowl, and melt (in 30 sec bursts, stirring after each burst). 3. Fill each case with a teaspoon of chocolate. Don’t overfill, a little goes a long way. This will get a bit messy. But heh, we’re living on the edge. Leave enough chocolate in the bowl to dip your Smarties in. 4. Place a marshmallow on top of each case-full of chocolate. Now this is important: Place the marshmallows with the smaller end down. Thus the end result will look (something) like a top hat. Ah ha, it all makes sense now! 5. Dip a Smartie into the remaining chocolate, enough to coat the underside, then place on top of the marshmallow. Et voila! Top Hats. If you can’t make these, there’s probably something wrong with you. 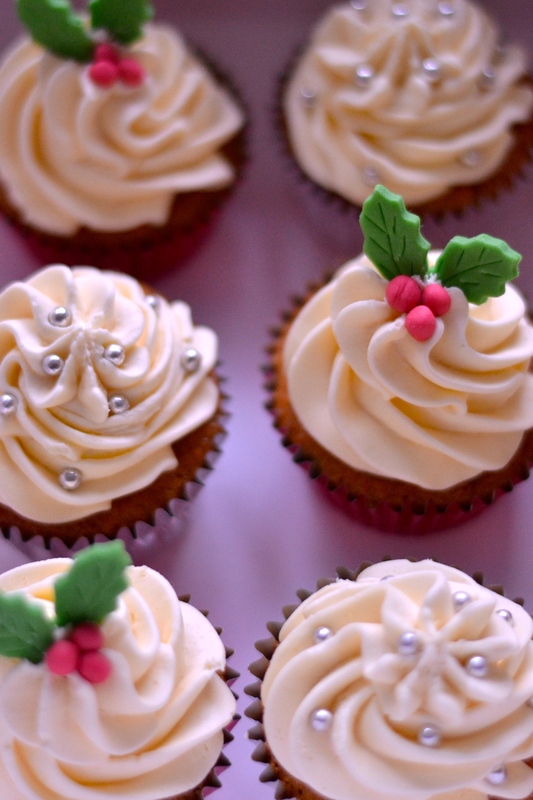 Try not to eat them all before giving them to the kids/cake sale. Or just eat them all. I’ve made extra so a few won’t be missed. There is just something about a marshmallow, sitting on a bed of chocolate, with a Smartie on top to add a bit of crunch, that really hits the spot. A super simple, gorgeously light yet filling vegetarian dish that should satisfy even the biggest of appetites. 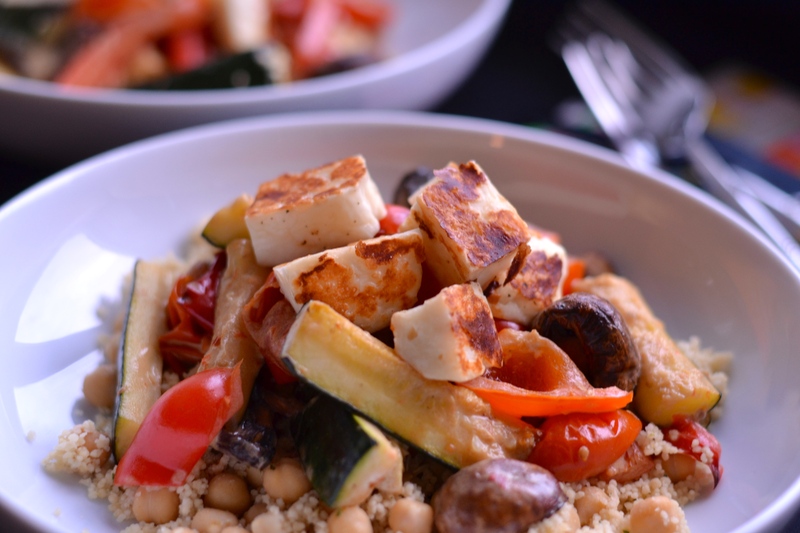 This gorgeously light, yet filling vegetarian dish is taken up a notch by the addition of golden halloumi. Why hello there. I realise it’s been a while. And that I’m not particularly consistent. Sorry about that. So I could jabber on for a few paragraphs about where life is at the moment (it’s hectic), what I’m up to (not a lot), or what pride-inducing antics my kids are up to (it’s hard to describe the full stabbing-oneself-in-the-eye-with-a-spoon-agony delight of the girls’ putting on their own dancing displays, showing varying degrees of expressive choreography – think Worzel Gummage being electrocuted). But if you’re like me, you’re going to skip to the recipe anyway, to see if it’s actually something you’d want to cook (basically, does it have a gazillion ingredients and require a water bath?). So I’ll keep this simple for you. The original recipe comes from BBC Good Food, and to be perfectly honest, I’ve not done a great deal to it. Basically I’ve added halloumi. Because, why not?? Halloumi, like bacon and chorizo, can take any dish to a different level. Period. This is a gorgeously light, yet filling dish that should satisfy most appetites (ok, perhaps not the ardent meat eaters out there, I’m not delusional), and is the perfect addition to your vegetarian recipe repertoire. 1. Heat your oven to 180°C (fan) and prepare the veg. 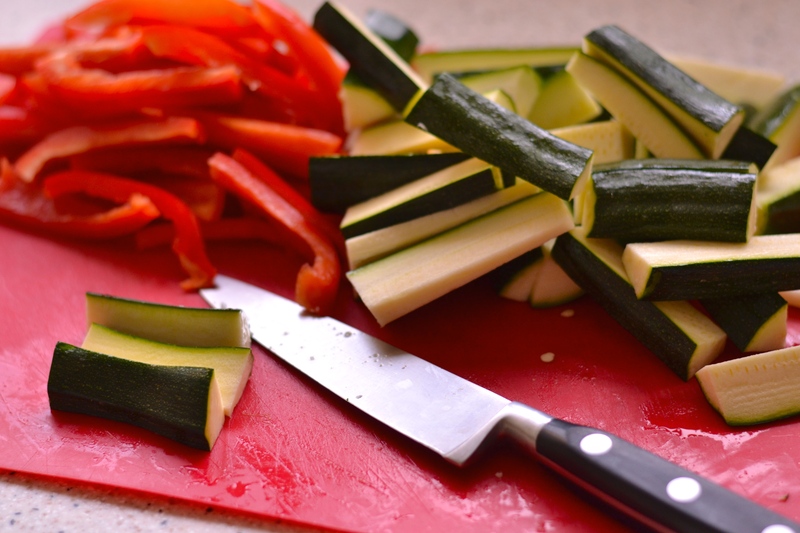 Note here, you want the courgettes in nice thick batons so that they hold most of their shape on roasting. 2. 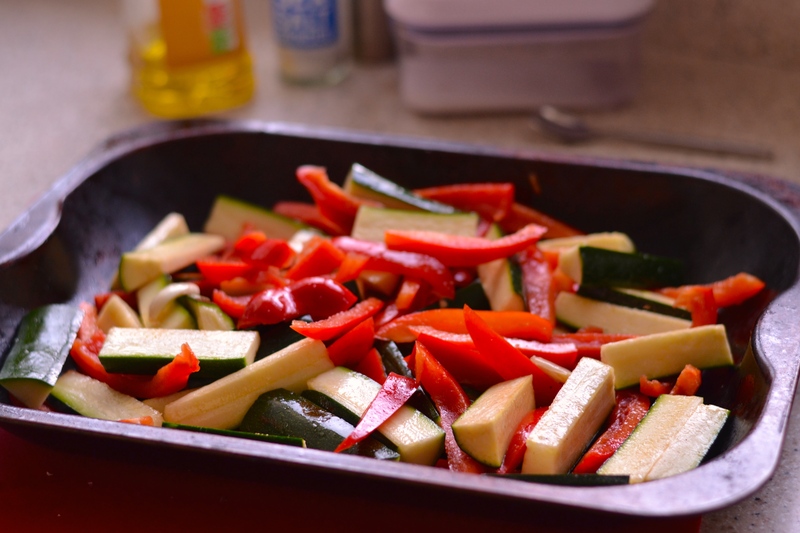 Put the peppers and courgette in a roasting tray with the garlic, oil, sugar and some seasoning (don’t be stingy). Chuck this in the oven for 20 minutes, then add the mushrooms, tomatoes and chilli, give a stir around, and roast for another 20 minutes. Note, you can use just one big roasting tray for this dish as you aren’t looking for the veg to crisp, so don’t worry if the tray seems a bit overcrowded. You want them softened and squidgy, releasing their lovely juices. 3. Make up the vegetable stock (it needs to be just made so that it is hot enough to cook the couscous). You can use just boiling water here instead, but I feel the couscous needs the additional flavour of the stock. 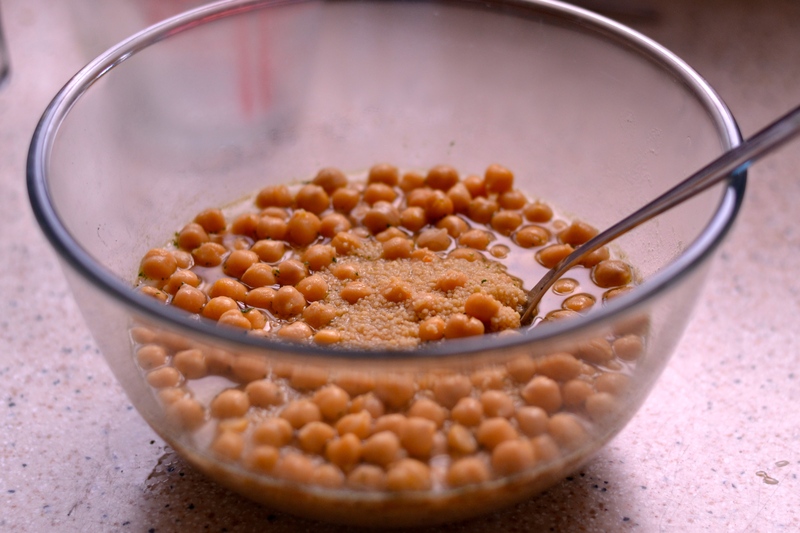 Stir together in a bowl the couscous and the chickpeas, then pour over the stock until the couscous is just covered. Clingfilm the bowl and leave it to stand for at least 10 minutes (if it stands for longer, it doesn’t matter). Once cooked, fluff the couscous with a fork, adding a little more stock if you think it needs it (although it probably won’t). 4. Whilst the veg is still in the oven (after the addition of the mushrooms etc), start to cook the halloumi. 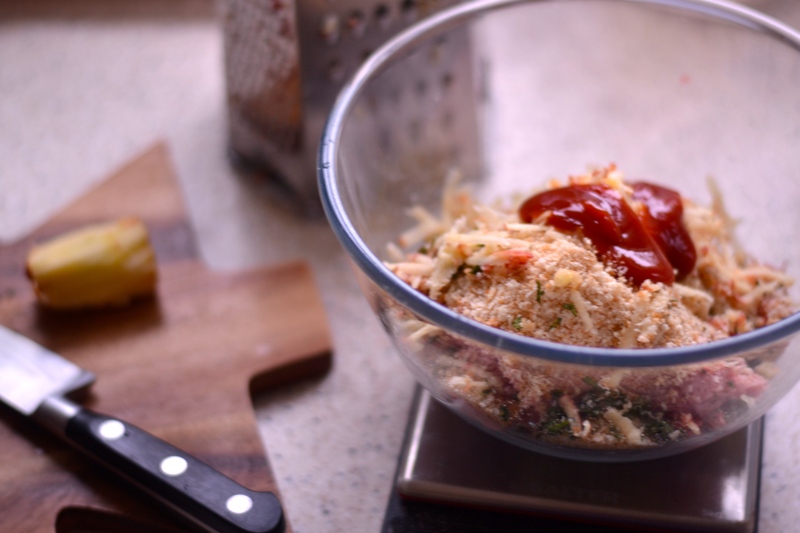 Heat a large frying pan over a medium high heat, and spread the cheese out, making sure each piece is nicely spaced. You don’t need oil. The halloumi will release some water, then once the pan has dried out start turning the cheese to get it golden all over. 5. Remove the veg from the oven and stir through the mascarpone (or soft cheese). 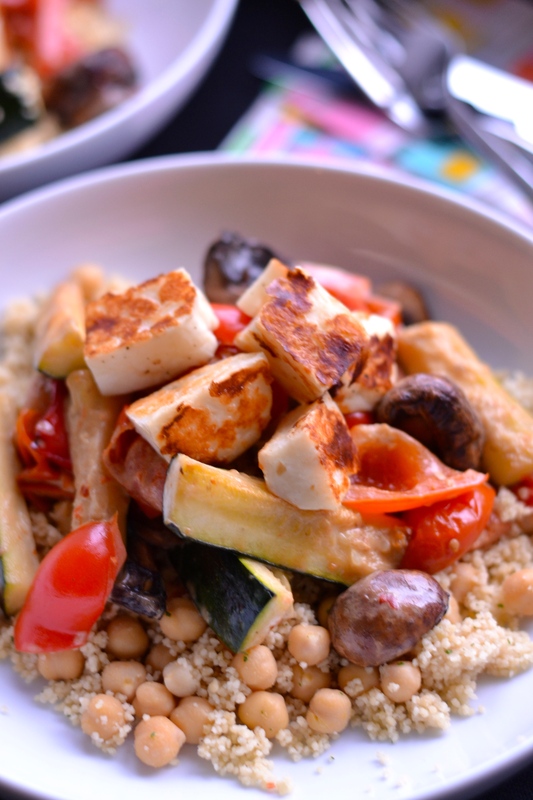 Divide the couscous between 4 plates and then top it with the roasted veg and some halloumi. If you’re looking for a vegetarian dish to try, give this a go, I promise you won’t be disappointed. 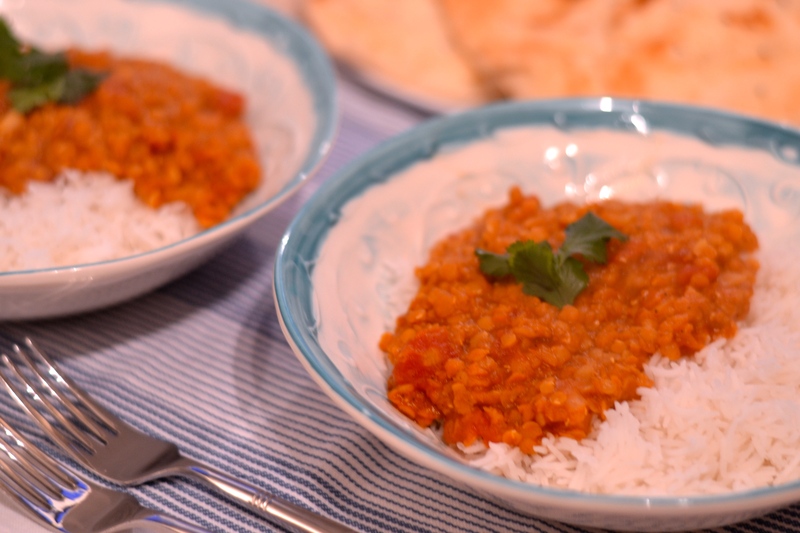 If you’d like to try more vegetarian meals then give my Filling Lentil Curry a try. Just a quick post about GDPR. And as they say in the cartoons, that’s all folks! 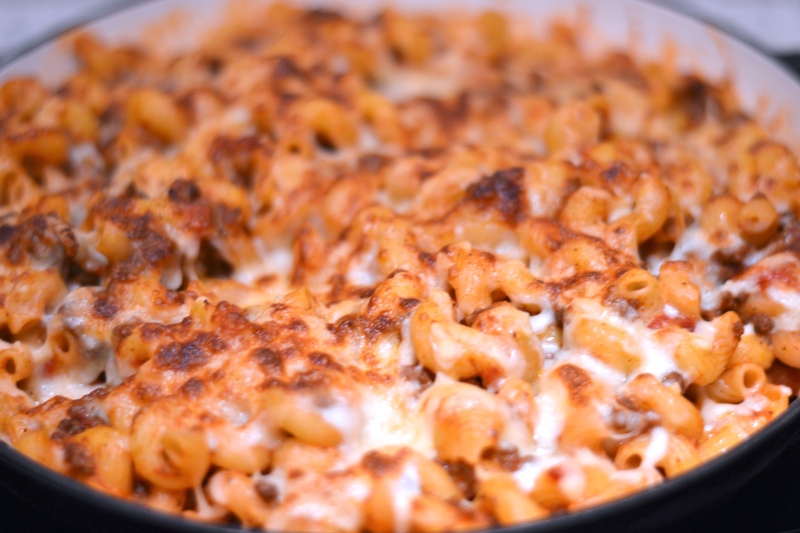 This cheeseburger pasta bake, topped with gooey cheese, is super simple to make, and will have your kids wanting more. I made a really nice lamb casserole yesterday for Sunday dinner. It was flavoursome, and melt-in-the-mouth. Everything a lamb casserole should be. I really was pleased with it. The girls barely looked at it (crying emoji). Henry, bless him, ate three helpings. I wouldn’t say the girls are fussy eaters, they’re really not. But there’s still a lot of stuff they won’t eat. It’s probably made worse by the fact there’s three of them, and they all dislike different things. So whilst one is eating something but not something else, another is eating what the other doesn’t like but not touching what they do like. Are you keeping up with this? No, neither am I. Hence the frustration. Something they all do appear to like though, is pasta. Buckets of the stuff. I buy the 3kg bags from Asda as we get through so much. So I’m always on the look out for different things to do with pasta. I could chuck spaghetti bolognese or my mac’n’cheese at them continually, but I like to try new stuff – and living on the edge. 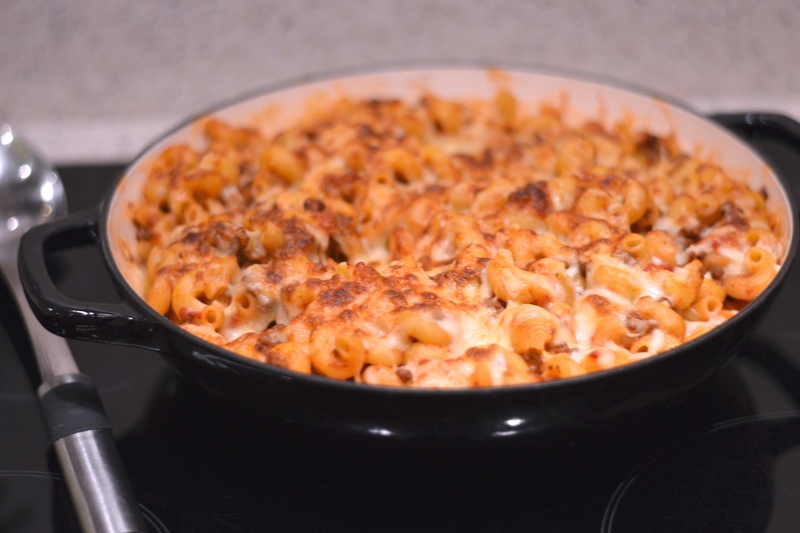 I’ve tried a couple of different recipes for Cheeseburger Pasta, the most recent was one from Slimming Eats. I tweaked it a little bit to suit us (my kids can spot an onion a mile off), and it went down a treat with the kids. Empty bowls all round. Hurrah. This recipe is really easy, so I didn’t photograph the various steps of the process. But the recipe is below. Regards quantities of pasta, I use about 400g to feed 2 adults and 4 children (with large appetites). Gauge however much you’ll need for your family. Give this a go, especially if you have pasta-loving children like me. Cook the pasta in a large pan of salted boiling water until soft (I don’t really do al dente, so cook the pasta until it is how you like it). In a small bowl combine the paprika, garlic powder, onion powder, mustard powder, salt and pepper. Heat a large pan over a medium heat and brown the mince. Add the mix of spices, tomatoes, tomato puree, Worcestershire sauce and sugar, and stir to mix. Let this cook for a while whilst the pasta is cooking. Once the pasta is ready, drain it, then add it to the mince mixture and stir to combine. 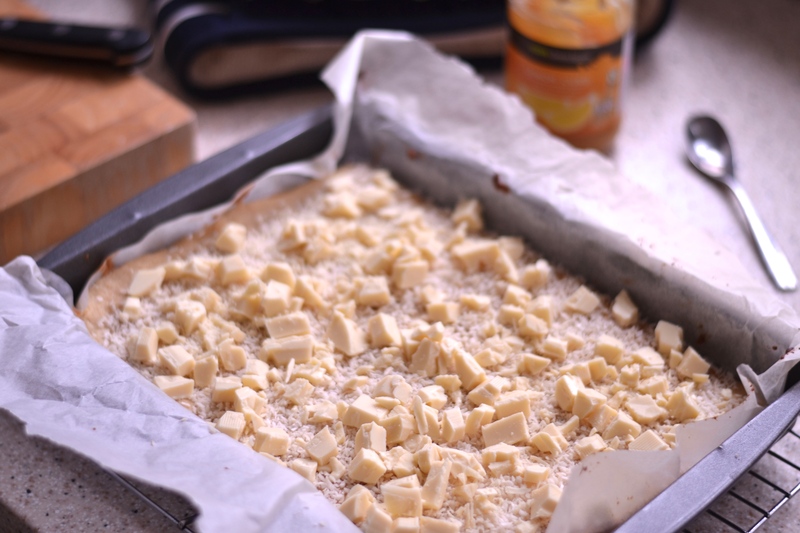 Stir through most of the cheese, then pour into an ovenproof dish (or make it in an ovenproof pan, thus saving some washing up). Top with the remaining cheese, and grill until golden and bubbling. 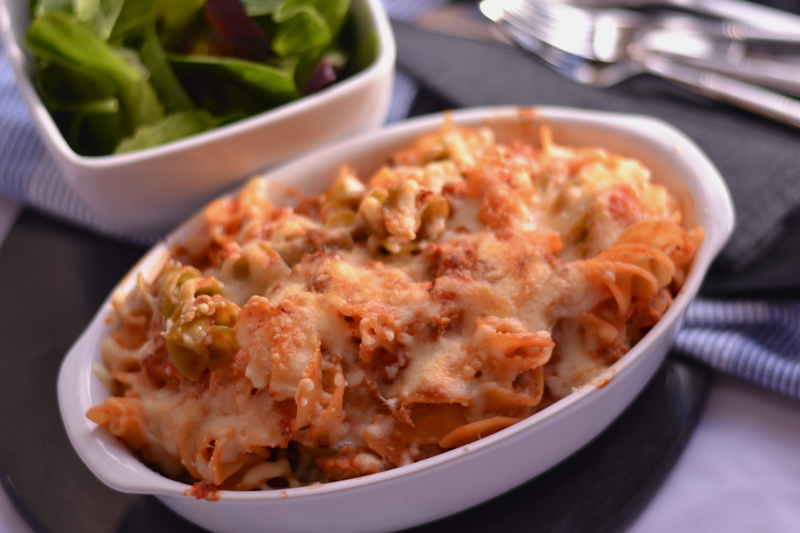 If you like this, why not try my Sausage Pasta Bake, or my Quick & Easy Tuna Pasta Bake? 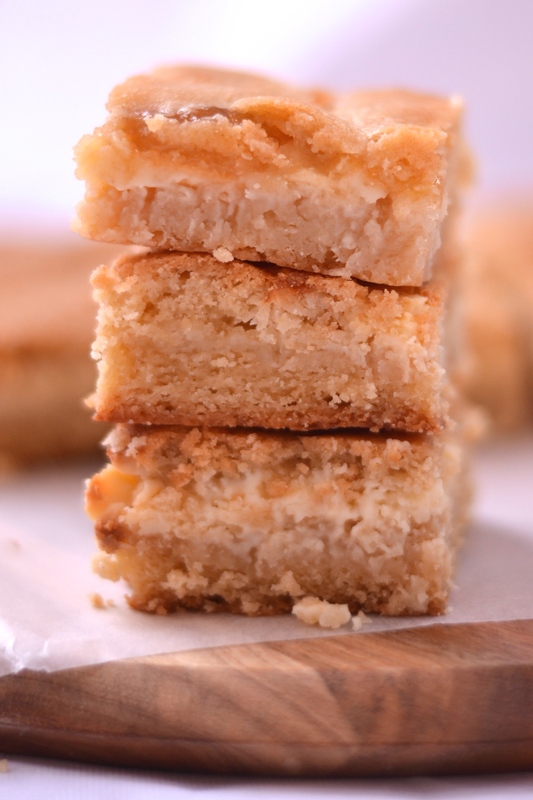 The delicious combination of white chocolate, lemon and coconut, merged together in a chewy cookie slice, is too good to resist. 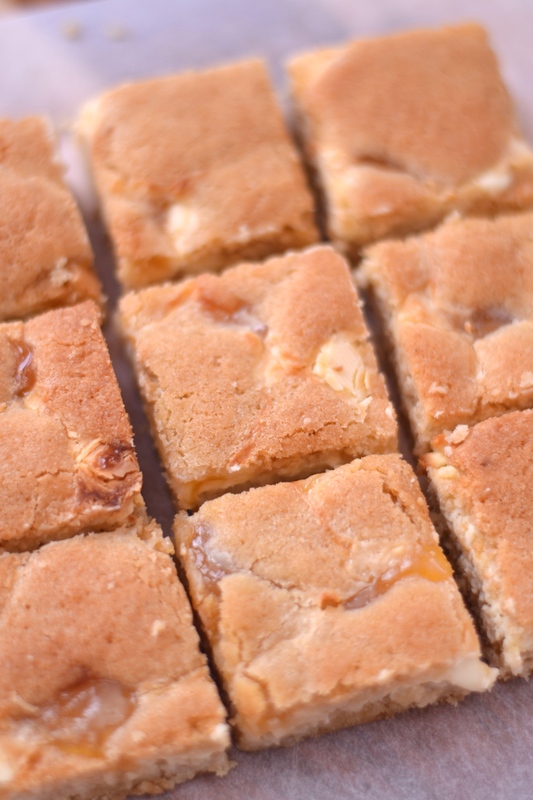 With the combination of white chocolate, lemon and coconut, these little morsels of deliciousness are too good to refuse. It’s the end of term. The summer holidays loom large. I don’t know about the rest of parents out there, but I’m reaching my tipping point. I’m maxed. Between sports days, special assemblies, summer fetes, non-uniform days, beach days (oh yes); with four kids all in separate classes, I’ve stopped knowing whether I’m coming or going. My wine consumption has hit a new high. I guess it has the advantage of making me look forward to the holidays. I can’t bloody wait. Another aspect of this is teachers gifts. I’m not the biggest fan of the concept as I think it’s putting added pressure on parents. But then on the other hand I’m so grateful there’s folk out there willing to put up with my cherubs so I don’t have to, they probably deserve something. With 4 teachers and 3 TAs, that’s a fair few gifts. So I decided to bake. It seemed like a good idea, definitely cheaper. But as I was trying to wrap up 14 bags of traybake squares, I wasn’t so convinced. However, it’s done, and I’m drinking red wine. 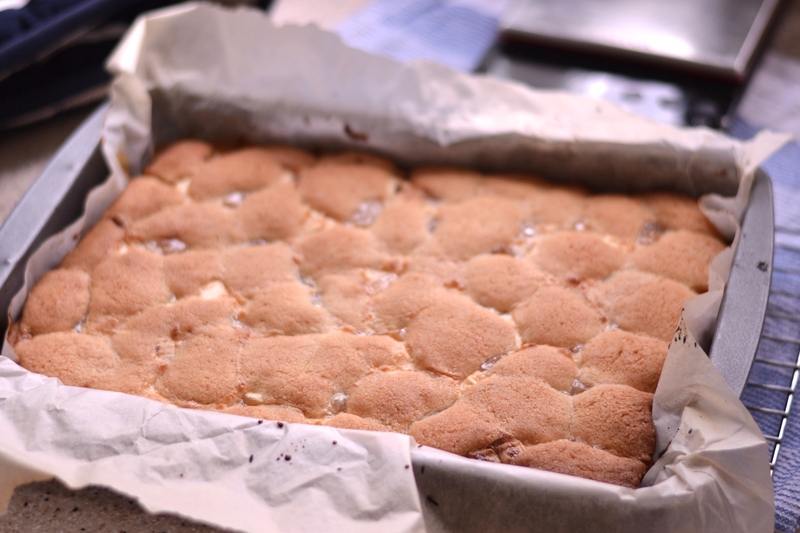 This recipe is one of the traybakes I made for the teachers (the other was my Triple Chocolate Fudgy Brownies). It’s a couple of recipes rolled into one, sprinkled with a bit of my own design. It’s good. 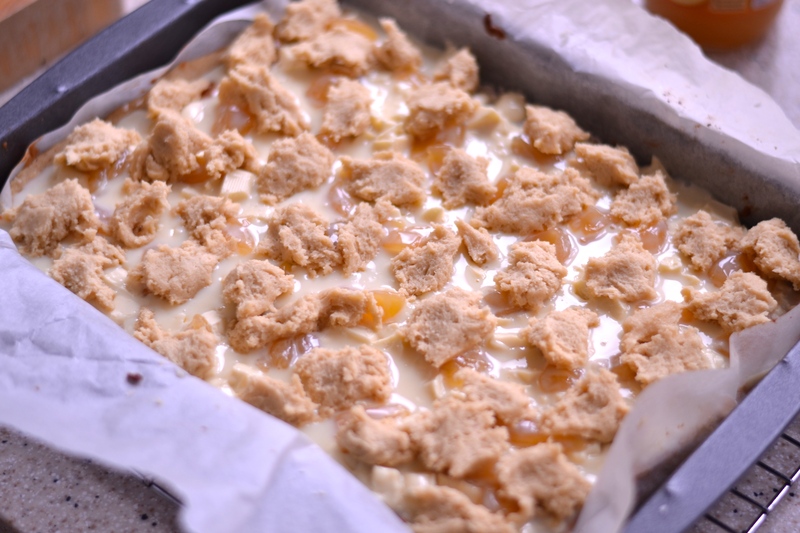 The Husband is a huge fan – and this contains condensed milk which usually puts him off. 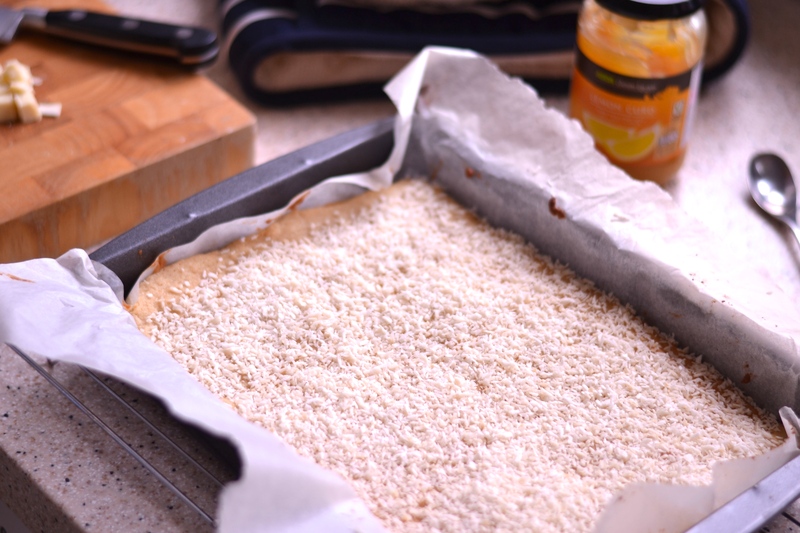 But the combination of white chocolate, lemon curd, and desiccated coconut is a winner, I promise. The only thing you’re actually making here is a basic cookie recipe – the rest is just throwing stuff in. It’s simple, and bloody lovely. 1. Preheat your oven to 170°C (fan). Grease and line a 12×9″ tin, or something similar in size. I use groundnut oil to grease as it has no taste, but butter is good too. 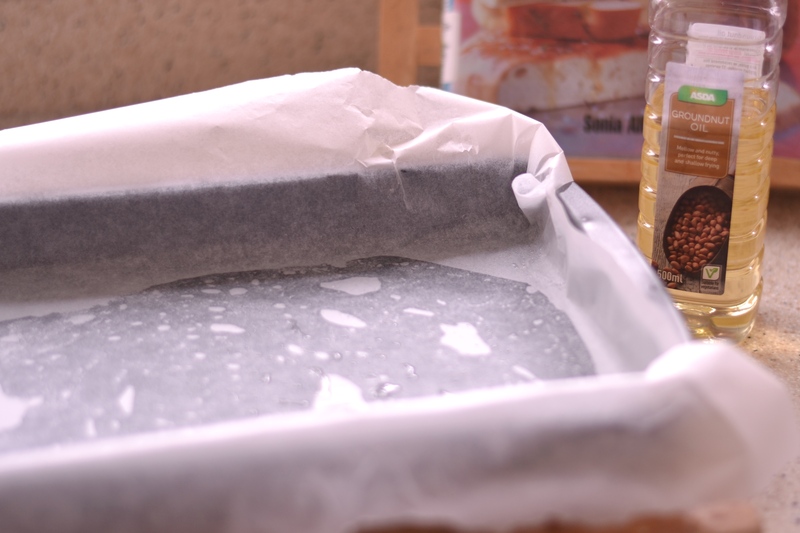 Just use some greaseproof paper and don’t bother cutting it to size or anything, just shove it in and make it fit. 2. 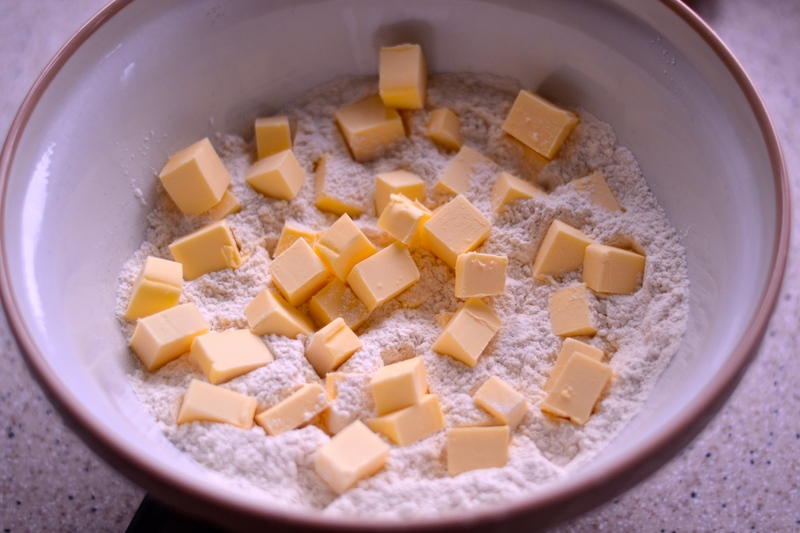 In a mixer, or using a hand mixer, cream the butter with both sugars until it has slightly lightened in colour (you don’t have to spend ages at this as you’re making a cookie dough, not a cake). Beat in the eggs and then the vanilla. Add the flour, baking powder and salt, and stir gently until fully combined. 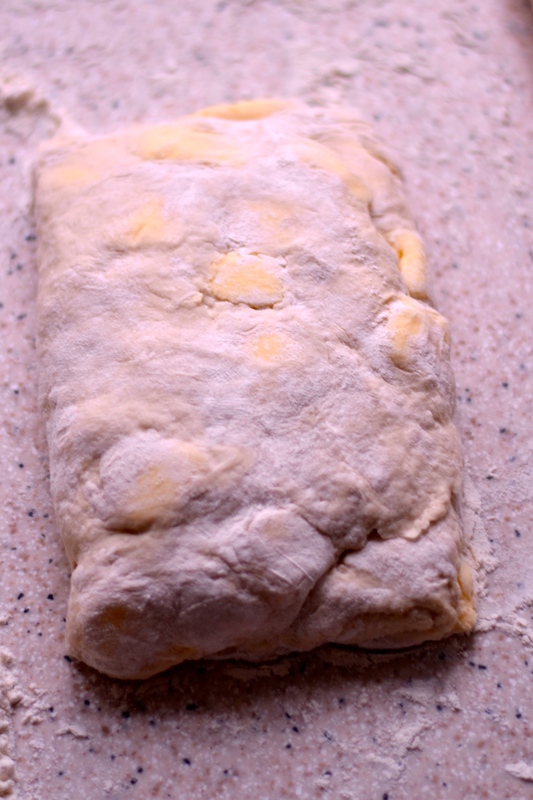 Press about 3/4 (three quarters) of the dough into your prepared tin. 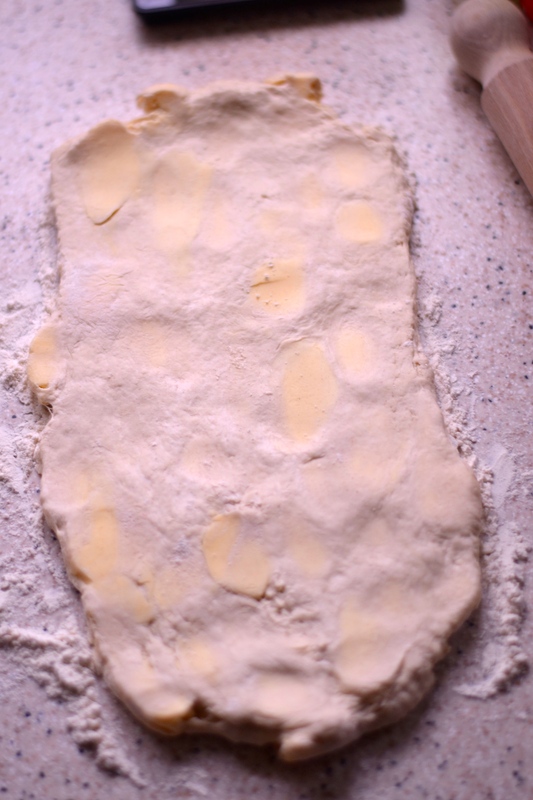 Put the remainder of the dough in the fridge until you need it. 3. 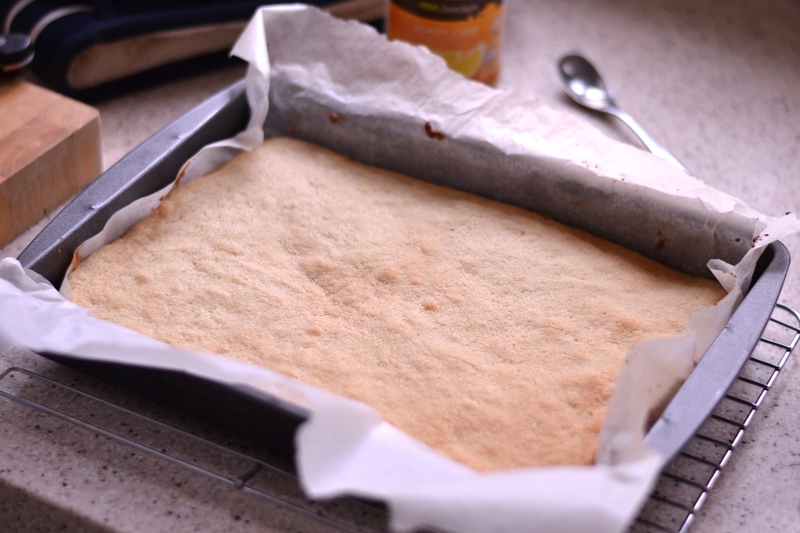 Pop the tin into your preheated oven for 10 minutes. 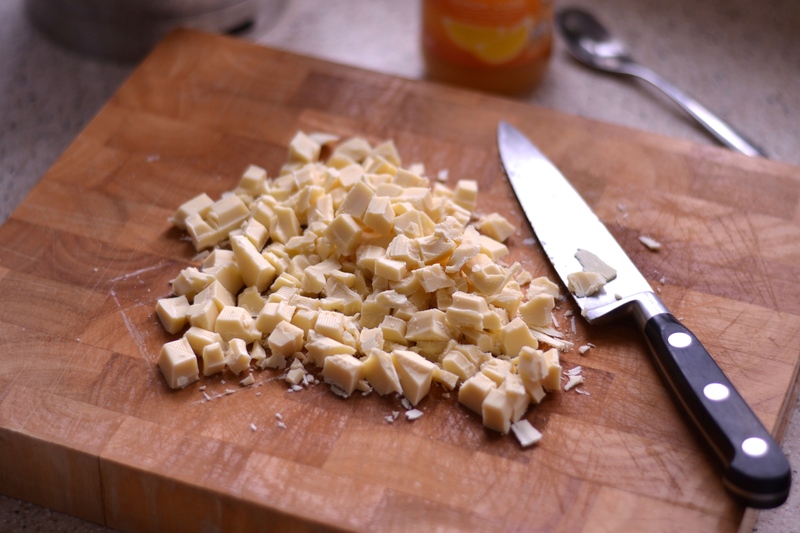 Whilst you wait for that, chop up your white chocolate. 4. Remove the cookie base from the oven. It should have started to turn a light golden brown. 5. Sprinkle over the coconut, evenly covering the cookie base. 6. Top this with the white chocolate. I used 200g of white chocolate. I’m not scared of it. The more, the merrier. Bring it on. But if you’re not sure (or just have 150g of white chocolate), you could use slightly less *cough* *wimp*. 7. Add small dollops of lemon curd, evenly spreading them across the base. Use as much as you feel it needs. 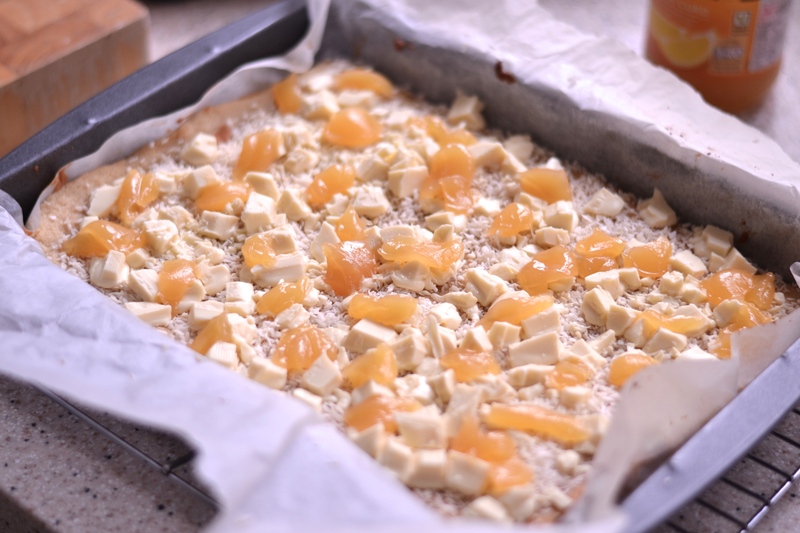 The tartness of the lemon curd contrasts the sweetness of, basically everything else in this recipe, so don’t be shy of using the full 100g. 8. Pour over the condensed milk. Now I hate waste, and not using the full tin of condensed milk went against my nature. But this recipe doesn’t need the full tin. So I poured over the required amount. And ate the rest. Winner. 9. Top all of this lovely goodness with pieces of the remaining cookie dough. 10. Bake in the oven for 20-25 minutes until nicely golden all over. 11. Remove and leave to cool completely before trying to slice. 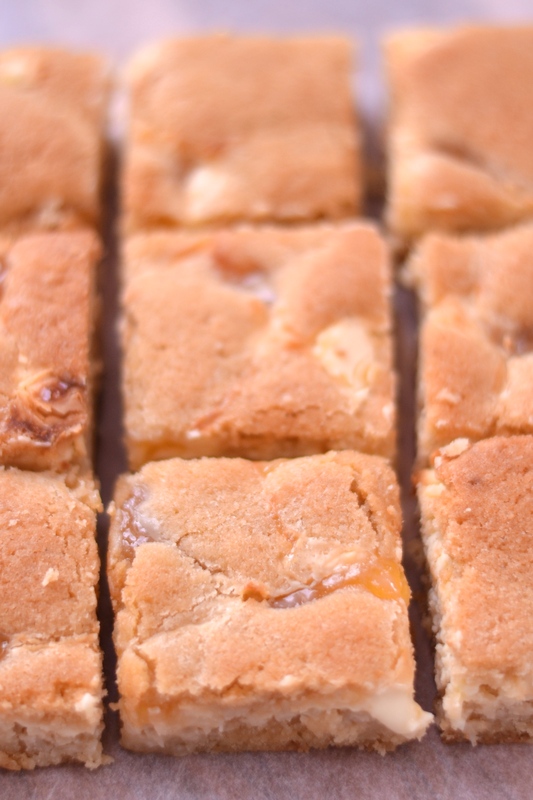 Depending on the size of your squares, you should get about 20 from this recipe. I tend to trim the edges to make for neater squares. I then eat the trimmings. But they don’t have calories so that’s ok. 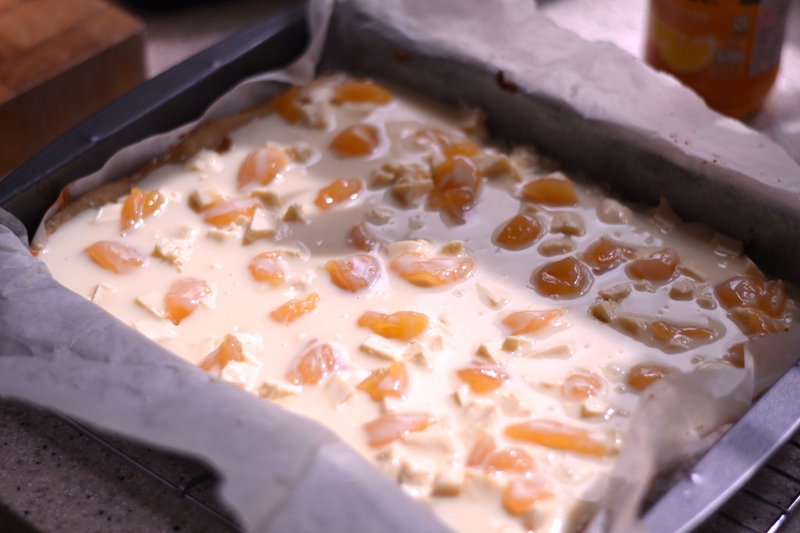 This traybake lasts for a good few days in an airtight container, and the flavours actually seem to intensify over a day or two. 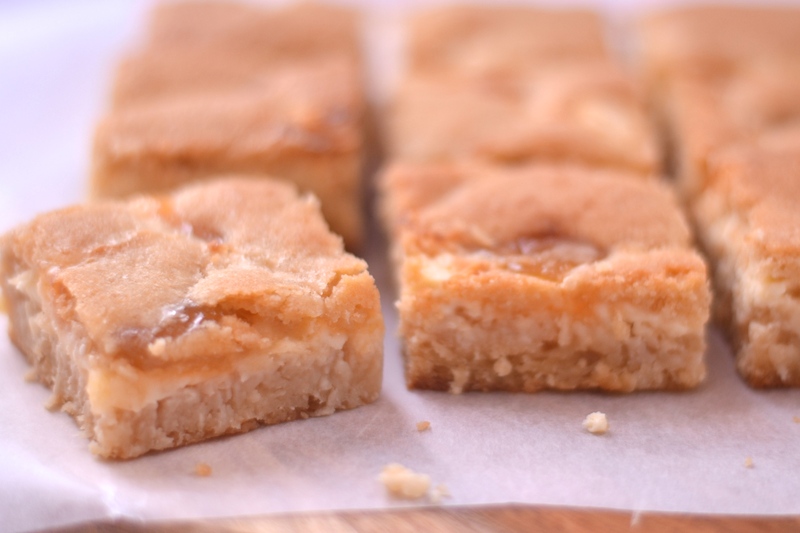 There’s something about white chocolate and lemon that goes so well. Give this a go and let me know what you think. Here are some of the ingredients I use regularly in my cooking, that I just couldn’t be without – my cupboard staples. I’m currently a bit incapacitated having just had an operation on my right hand – nothing serious, but it’s left me a bit useless for a while.There’s no possibility of me cooking up a new post at the minute, but I thought I could write something a little different instead. Throughout all of my posts, there are certain ingredients that you’ll see reappearing. These are my cupboard staples. I always have these in my kitchen. I’m sure everyone will have their own, but I figured I’d share mine with you (hell, it’s my blog). I’ve actually been meaning to write this for a while, so here you go. I very rarely chop an onion nowadays, seriously. The bags of frozen chopped onions that are available from most supermarkets are way too convenient. I use them in most of my cooking. 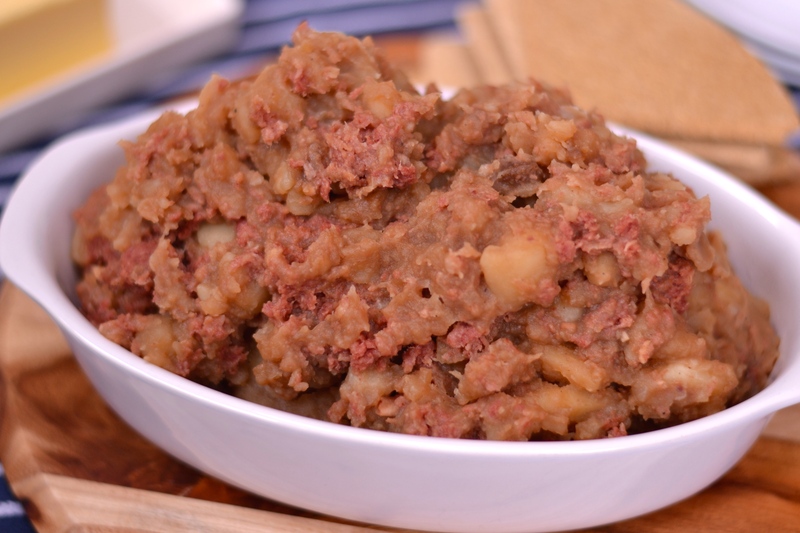 From curries, to casseroles, to my Traditional Scottish Stovies. If the recipe calls for chopped onion, I’ll use frozen. And I’m totally unashamed of the fact. The difference between fresh basil and dried basil is massive. The fresh taste of basil is beautiful. I think it can lift an entire dish. Pasta sauces, pizza sauces, risottos etc – if a dish calls for basil, chuck in the fresh stuff. And by fresh, read freshly frozen. It tastes the same. Again, it’s all about convenience. That and the fact I’ve killed every basil plant I’ve ever bought within days of getting it home. But I wouldn’t be without a bag of frozen chopped basil in my freezer (I usually get mine from Waitress as they do a handy little pouch, but I’ve also gotten it from Sainsbury’s in the past). Occasionally I have been known to be super-efficient and I’ve chopped fresh basil leaves then frozen them in small tupperware boxes. This totally works and is undoubtedly cheaper. Usually though, I’m just not that efficient. These are my ‘secret ingredient’. Just not that secret. I chuck them into a tonne of recipes. If I want something to taste a bit meatier, I’ll add an oxo cube. 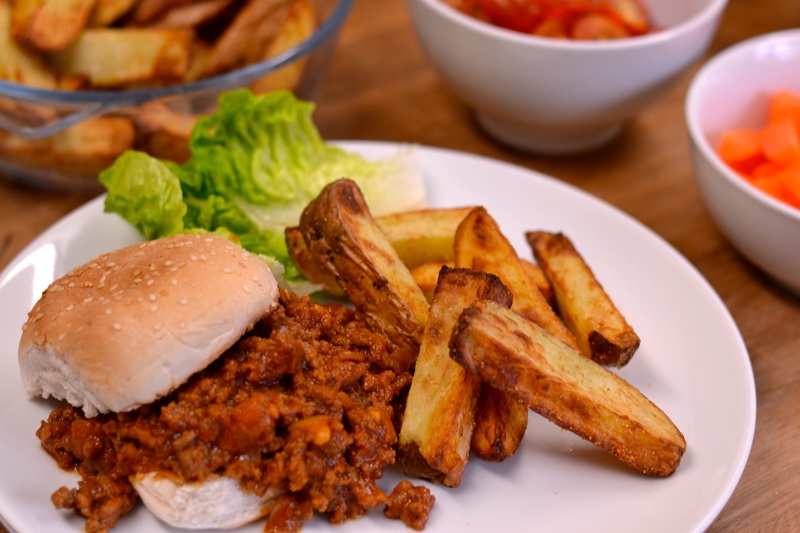 Bolognese, chilli, Sloppy Joes – they all get an oxo cube thrown in. I use them in gravies (including chicken gravy) and casseroles, and stews. Pretty much the same goes for these as the oxo cubes, I’m just a little bit more selective (they’re more expensive). I’ll be more inclined to chuck one of these in gravy, and I use one plus an oxo cube in my Stovies. 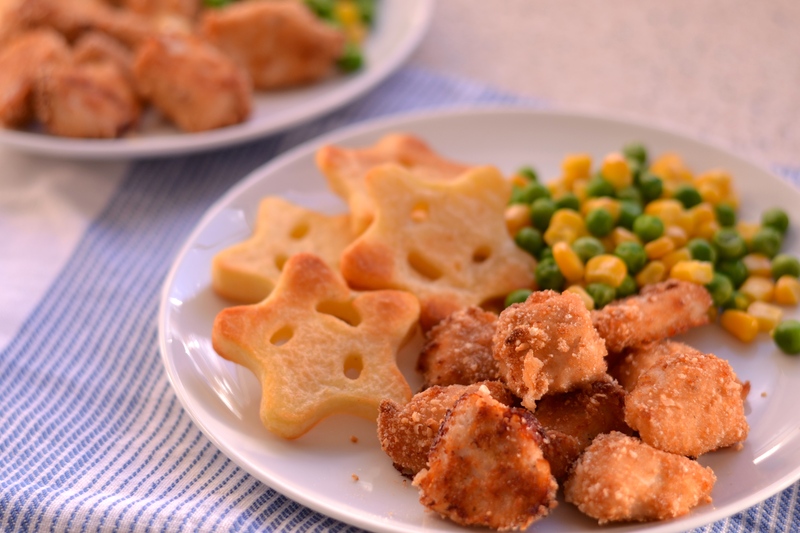 For a long time (aka my triplets first 5 years) I had gotten really lazy with my cooking and I was only really using both frozen garlic and garlic paste in place of fresh garlic. There is nothing wrong with this. I tend to find frozen garlic has a bit more of a natural garlic taste. But the paste is good, and if I’m cooking something where garlic isn’t the overriding taste you want ( e.g. curries, stir fries), I’ll happily chuck paste in. I have gotten slightly less lazy of late, and have gone back to using fresh garlic in certain dishes – sometimes a dish really needs the more intense flavour. However, I still have both frozen and paste in stock, and I’m not afraid to use them. My kids love peas and sweetcorn. If I’m in any doubt about the nutritional value of a meal, I’ll chuck a mix of the two onto each plate and feel much better about my parenting. Although I’d always used frozen peas, I was a bit more skeptical of frozen sweetcorn until I tried it. It’s every bit as tasty as the tinned stuff, and a lot more convenient. I’ll chuck peas and sweetcorn into a wide range of meals too, just to up the veg content. If in doubt, add peas and sweetcorn. When it comes to feeding the kids, there are at least 2-3 meals a week where we don’t eat as a family. More often than not, I make simple grub – quesadillas, baked potatoes, beans on toast etc. If we’re dashing out to Beavers/Rainbows/swimming (*delete as appropriate), I generally can’t be arsed fannying about with proper cooking. However, sporadically the ‘mum-guilt’ will set in and I’ll feel the need to give them something a bit more nutritionally balanced, or at least something that I’ve spent more than about 5 minutes cobbling together. This is where tuna is handy. For a start, they like it. Halle-bloody-lujah. It can also be turned into really simple dishes that don’t take forever to make. Both my Tuna Pie, and Tuna Pasta Bake are regulars on the menu and so I wouldn’t be without a couple of tins of tuna in my cupboard. I like indulgent cooking. Why have a tomato sauce if you can have a creamy tomato sauce? Unfortunately, indulgent cooking doesn’t really like me. Or at least my waistline. But I’ve found that simply adding a spoonful of either creme fraiche or quark (a new discovery as I was completely cynical of it before I tried it) has pretty much the same effect as adding double cream – ok, the result is lighter, but personally I like that. I mostly use them in pasta sauces and risottos. You can always find a tub of one or both in my fridge. When I think about it, there’s a whole host of stuff I like to keep stocked up in my kitchen. I’m not going to bore you with everything. But some of the other things include: condensed milk (a lot of traybakes I make need this, like my Nutella Magic Bars); bars of chocolate – milk, dark & white (I like to bake, so a stash of chocolate is useful – see my Triple Chocolate Fudgy Brownies); the ingredients for making a simple sponge (i.e. butter, sugar, eggs flour – that way I can throw together a simple jam sponge for pudding, or my Microwave Banana Pudding). And obviously things like pasta, rice, potatoes and tinned tomatoes are an absolute must. That’s pretty much my must-haves. As soon as they start to run low, they get replenished. I have been known to run out and it’s been fairly catastrophic, let me tell you (#firstworldproblems). Oh, and of course the wine rack – god forbid that should ever run dry. Let me know what you like to keep stocked in your kitchen – is it different to me? 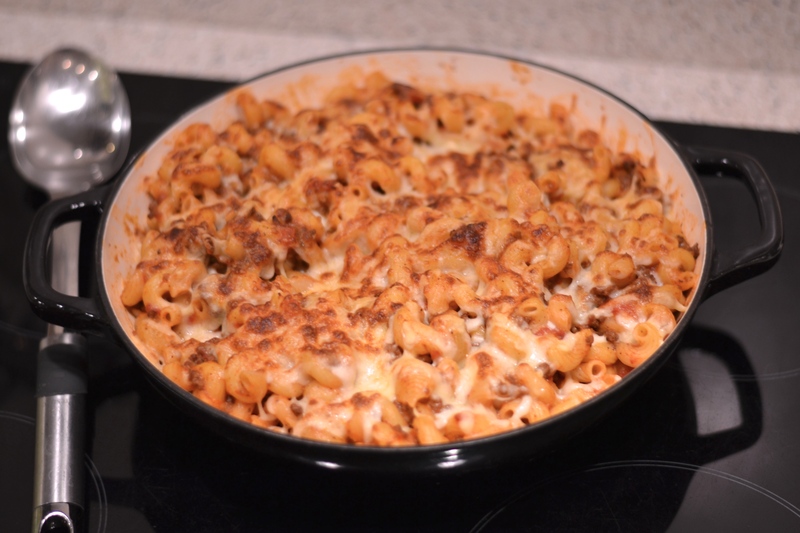 This super simple and quick sausage pasta bake tastes like it should be full of calories, but it really isn’t. Perfect for a midweek dinner for the whole family. 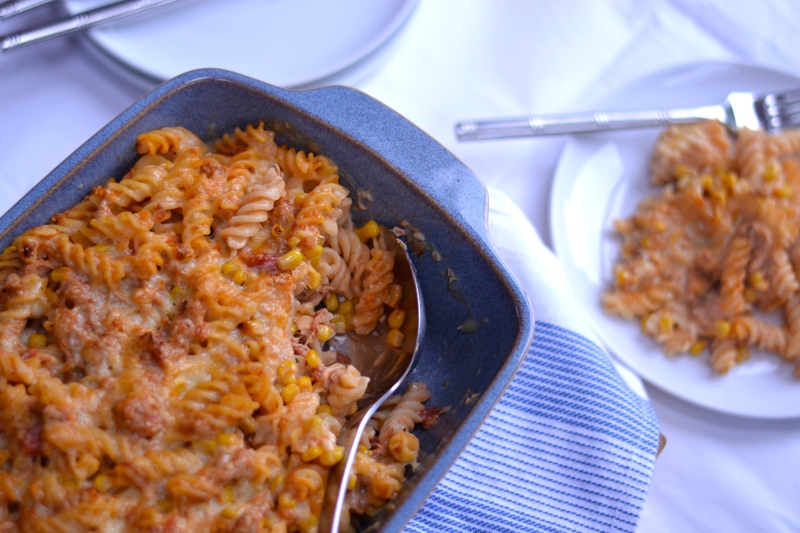 This Sausage Pasta Bake is such a creamy, cheesy bowl of deliciousness, you’ll never believe it’s diet friendly! I’m such a cliche. It’s the new year and I’ve joined a diet club. This is not a new thing. I’m back at Slimming World having joined and rejoined on at least a half dozen occasions. But I’m determined this time. This time I’m going to stick with it. Really. No, really. So at the moment, meals in the HC household are of the healthier persuasion. Well, ok, I’m still feeding the kids macaroni cheese and cheese & bean pastry pie on a fairly regular schedule. But generally we’re eating stuff that can be made SW friendly like spaghetti carbonara (yes really) and pork chow mien. 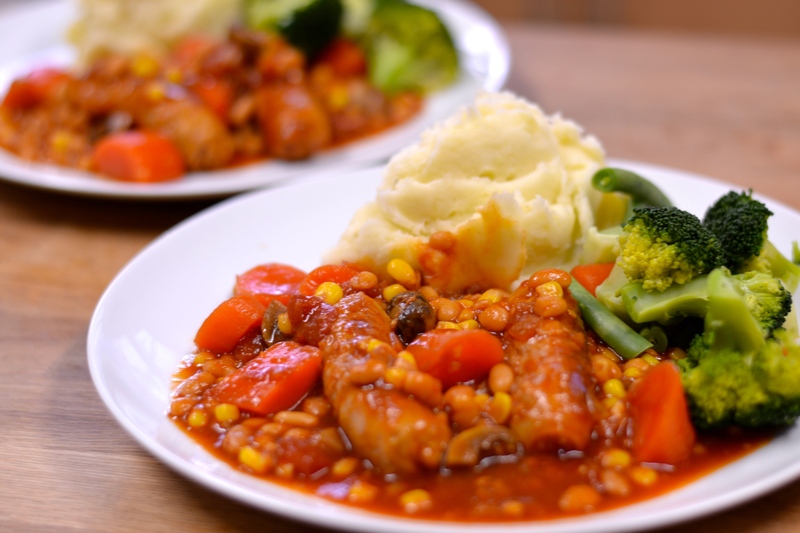 To make this process a little more interesting, I’ve also discovered a couple of really good food blogs that are dedicated to Slimming World recipes. One of which is Two Chubby Cubs. Their site is full of really good recipes that not only sound tasty, but are tasty. They’re also bloody hysterical. As long as you’ve got a sense of humour and aren’t easily offended, I’d highly recommend checking them out, if only for the witty repartee. 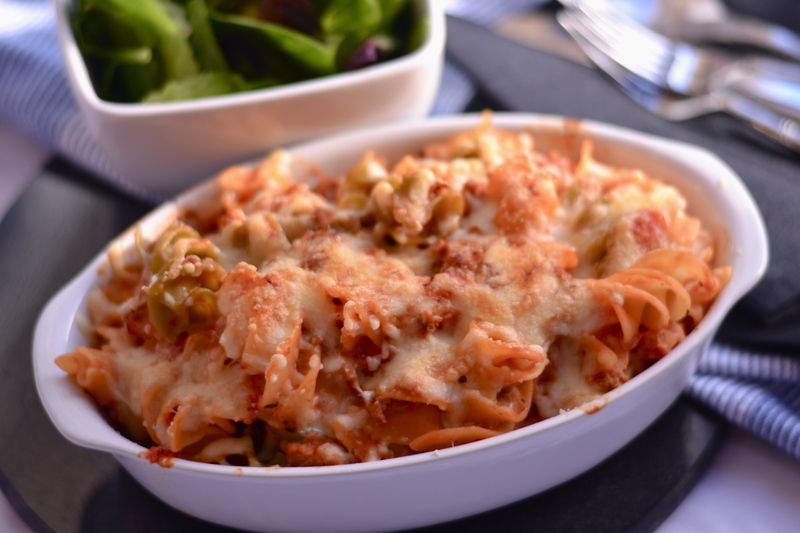 This recipe for Sausage Pasta Bake is a take on their One Pot Sausage Gnocchi Bake. I like gnocchi, but it’s easier for me to substitute it with pasta so the kids will eat it. Now, if you’re at all familiar with the Slimming World diet, you’ll most likely have heard of Quark. It’s hailed somewhat like a food from the gods. I never quite got it. Until I added it to a pasta sauce. It gives a creaminess you’d get from adding cream cheese, but without the raised eyebrows at SW class. 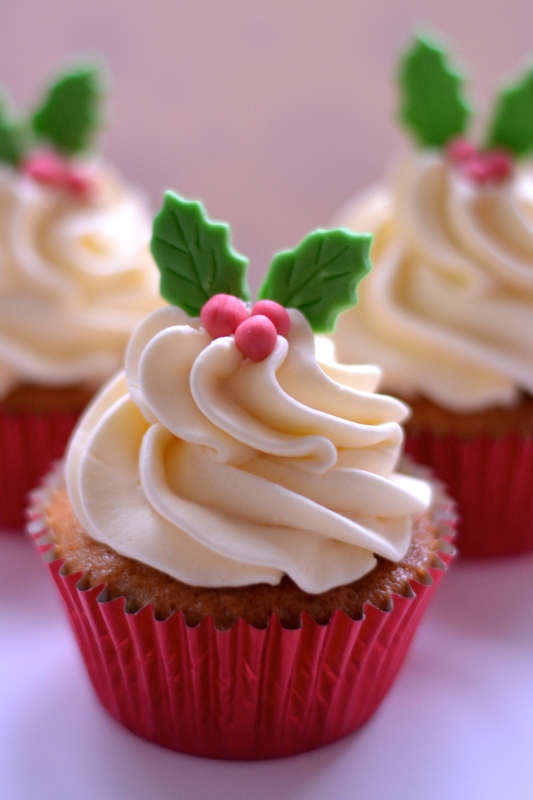 It’s added in this recipe, but if you’re not fussed about the calories, just use cream cheese. The sausages are your call. If you’re trying to be healthy, there are plenty of fat-reduced sausages on the market. Personally I’ve found I like Porky Lights (again, if you know anything about SW, you’ll know what a cliche that is). But use whatever sausage you like. I’ve also made this recipe with tuna and chicken, so you can be even more saintly. 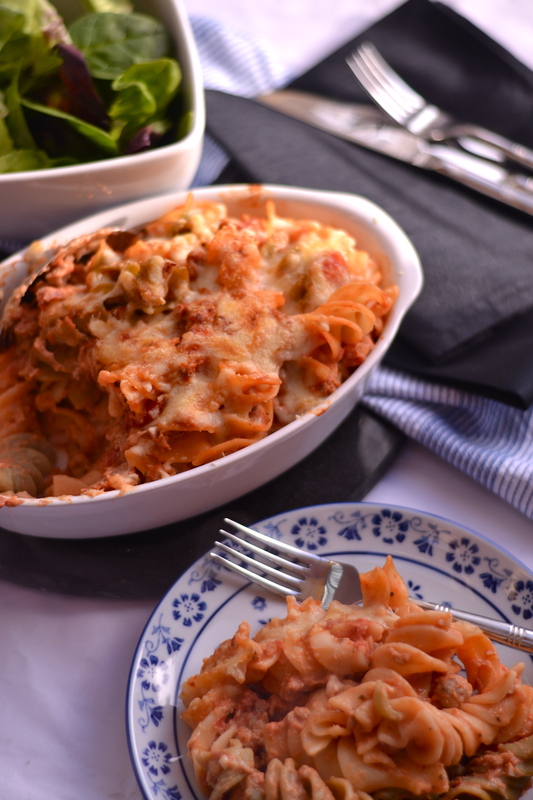 This pasta bake has become a staple now in our house. It stays inline with my effort to shift the second belly, and the kids like it. If I’m ever going to succeed in cutting the flab, I need meals like this, that the whole family can eat. 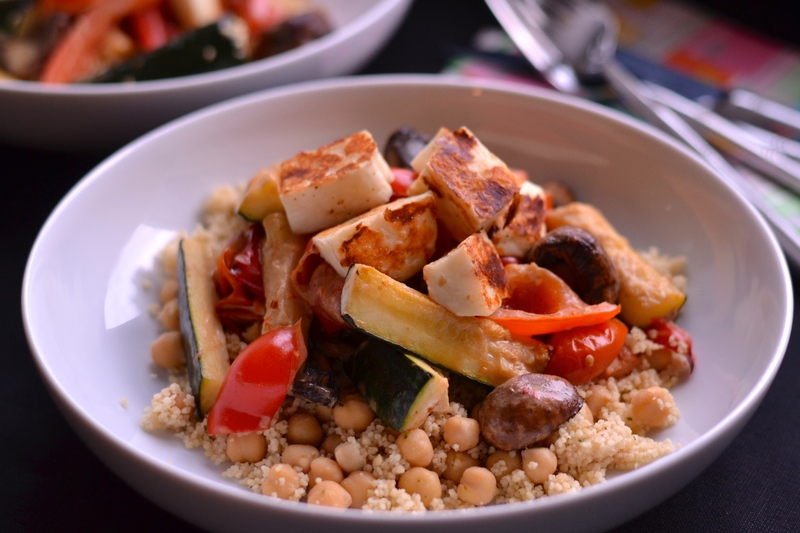 But even if you’re born with a metabolism faster than Usain Bolt and couldn’t give two hoots about eating healthier (I hate you, I really do), this is a really tasty dish that is well worth a go, especially for a midweek quick and simple dinner. 1. Boil a large pan of (well) salted water and add your pasta. Cook until soft (I don’t like my pasta al dente, so cook it however you like it). 2. Meanwhile, spray a pan with oil over a medium heat, and add the sausage meat, breaking it up as it cooks. Cook until browned through. 3. Add the garlic and cook for a couple more minutes, then add the tomatoes, basil and seasoning. Let simmer for about 10 minutes, to let the flavours evolve a wee bit. Taste, and add more seasoning if required. 4. Stir through the quark. 5. Once the pasta has cooked, drain it, and then add it to the meat sauce. Stir through. 6. Pour the pasta into an ovenproof dish and top with the cheese. 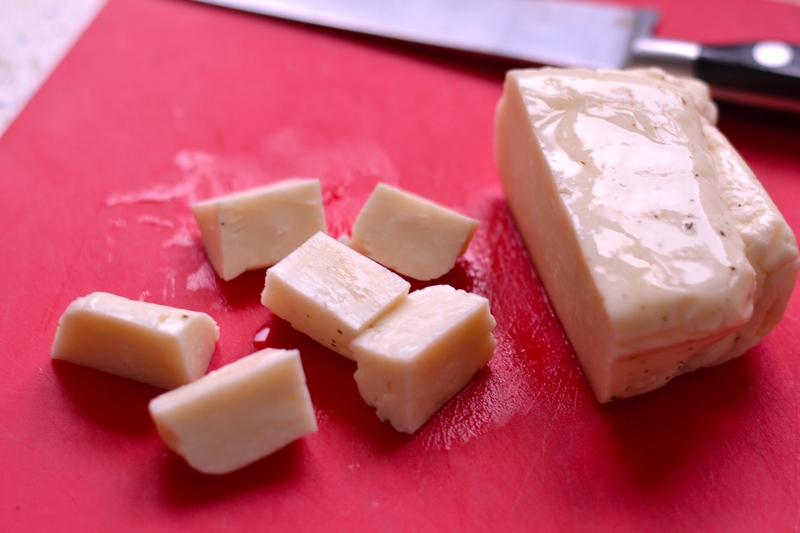 Pop under a hot grill until the cheese is golden and bubbling. 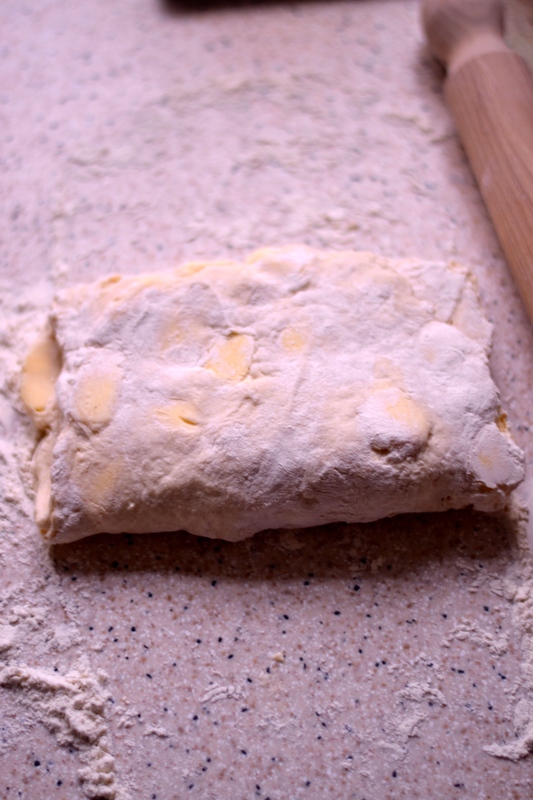 Homemade Rough Puff Pastry – Don’t be scared of making your own puff pastry, really simple to make, it just takes a little time but the results are oh so worth it! 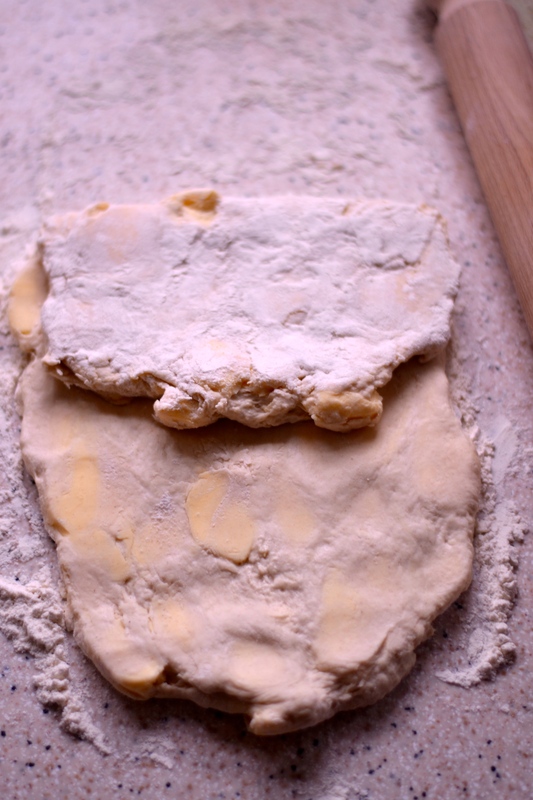 Have you ever thought about making your own puff pastry? Of course you haven’t. Why would you? You can buy lovely blocks of puff pastry ready made from the supermarket. And anyway, from what you’ve seen on the Great British Bake Off, it looks ridiculously complicated doesn’t it?! I love GBBO, but if I have one little niggle with the show (ok it’s a fairly sizeable niggle, just ask my family and friends…), it’s that they over-complicate the simplest of things. I realise it’s all for dramatic effect, but I think they genuinely put folk off making stuff that isn’t really that hard. I tried making my own puff pastry a few years ago when I was going through an ‘experimental’ stage (just in the kitchen mind!). I used a James Martin recipe, and the result was the lushest, butteriest puff pastry. And it was really easy! Honest! I’m not going to lie, nine times out of ten, I’ll use shop bought puff pastry. Why wouldn’t I? It’s really good and really convenient. But when I’ve got a little more time on my hands, and feeling a little bit more extravagant, I make my own (about once a year). This does take a bit of time, so only make it when you’re going to be home for a while. But the length of time is mostly the pastry sitting in the fridge, so you can be doing a multitude of other stuff at the same time. Believe me, this is totally worth a go. 1. In a large bowl mix together the flour and salt. Add the cubed butter. 2. 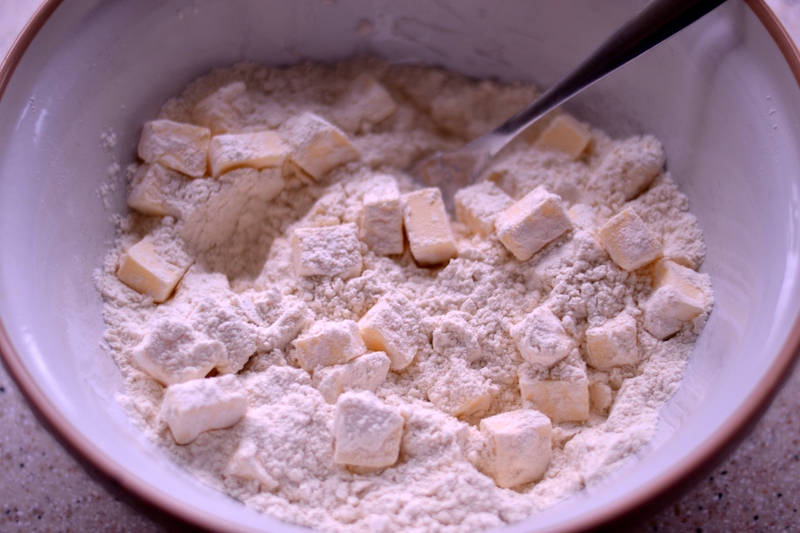 Mix the butter into the flour without breaking up the lumps. I use a fork to stir through. 3. 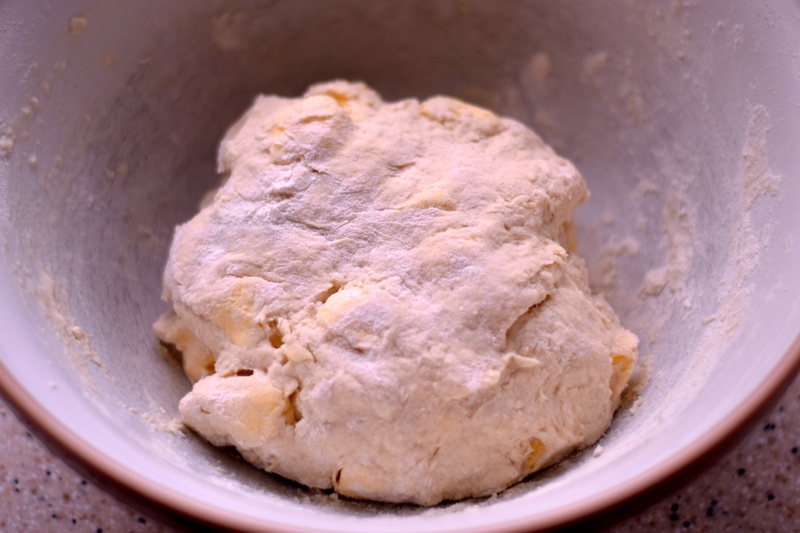 Add the lemon juice to the water, then gradually add it and mix to a stiff dough. I start using the fork to bring it together, then use my hand to bring it into a ball. Just use as much water as needed to bring it all together. 4. 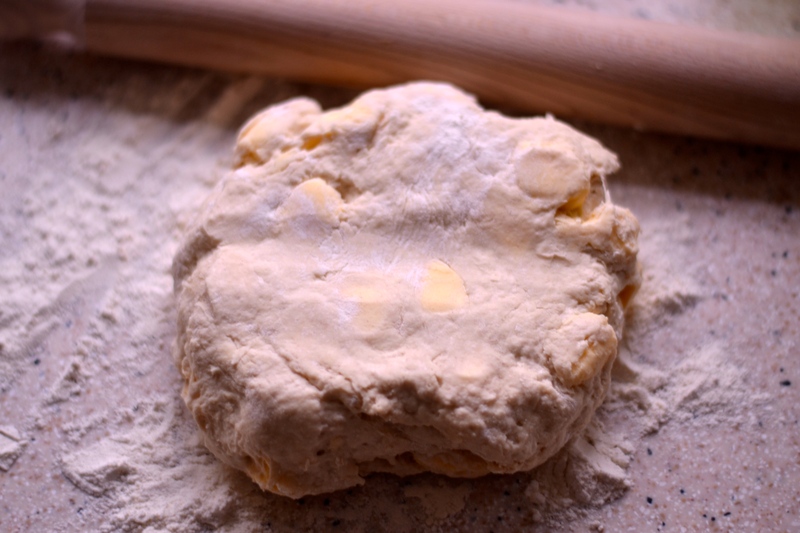 Flour your work surface and place the ball of dough onto your surface. 5. 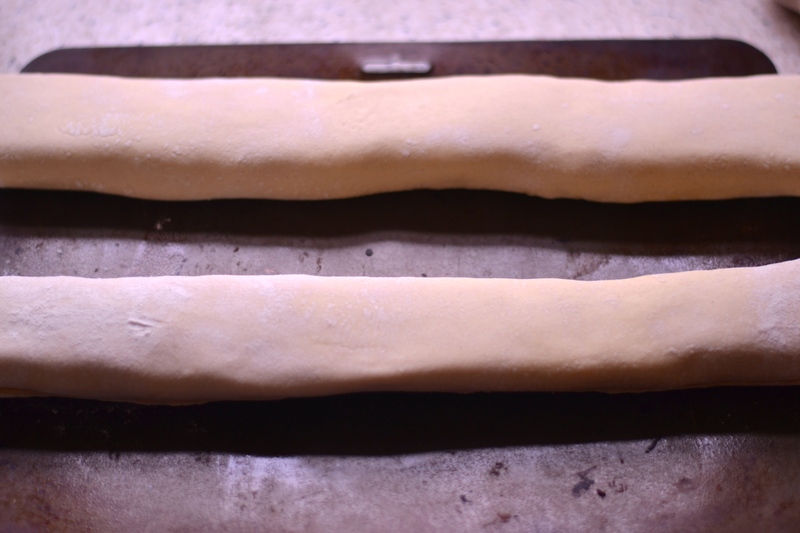 Roll the dough out to a long thin rectangular, about 40x15cm. You’ll notice the lumps of butter in the dough. Use your hands to straighten the edges a bit. 6. 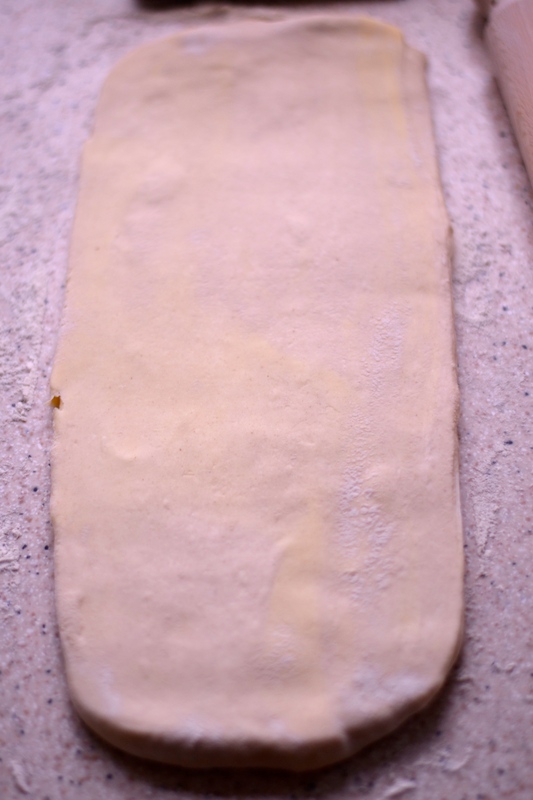 Fold the top third of the dough down. 7. Then fold the bottom third up on top. 8. 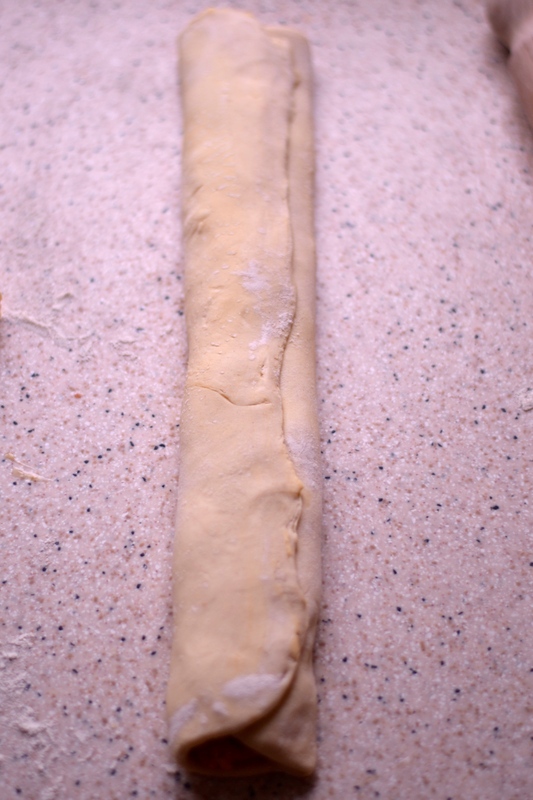 Turn the pastry sideways as in the pic, and then press down on the edges with the edge of your hands to seal it. 9. 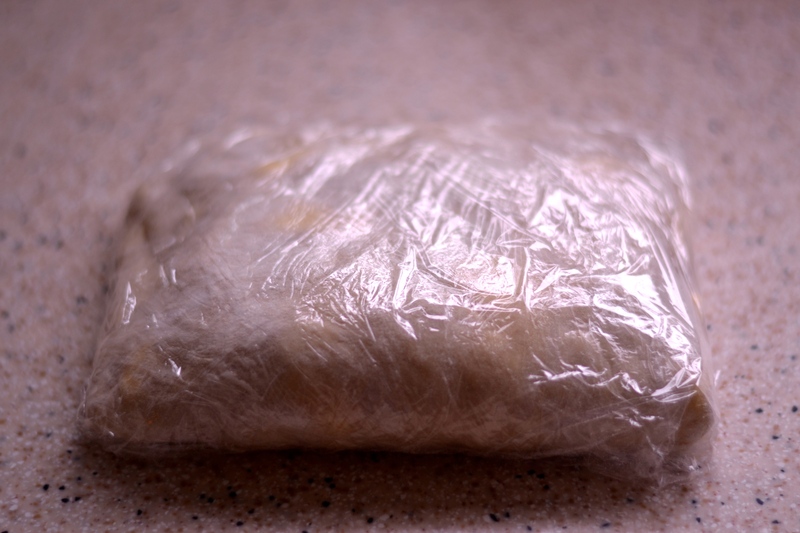 Wrap the pastry in cling film and place in the fridge for 15 minutes. 10. 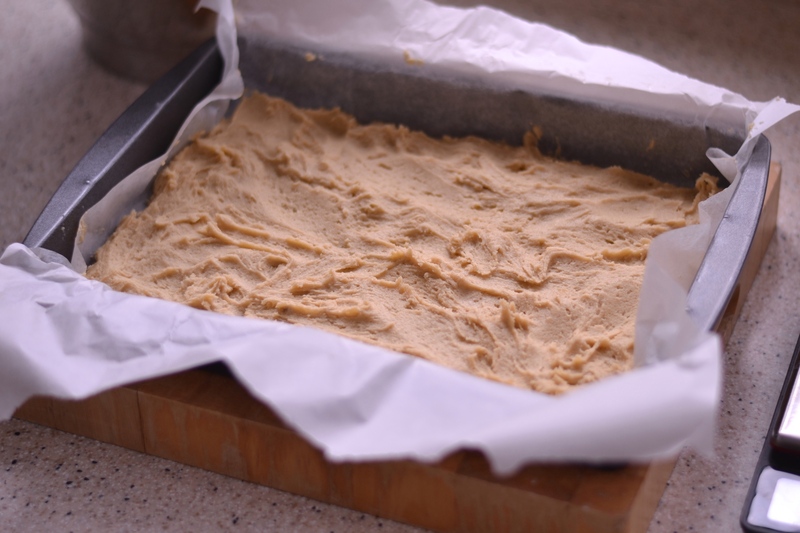 Take the pastry out of the fridge after 15 minutes (if you leave it longer it doesn’t matter, you just want it cold) and repeat the above process a further 4 times. The blobs of butter won’t be noticeable and you should see streaks of butter throughout. 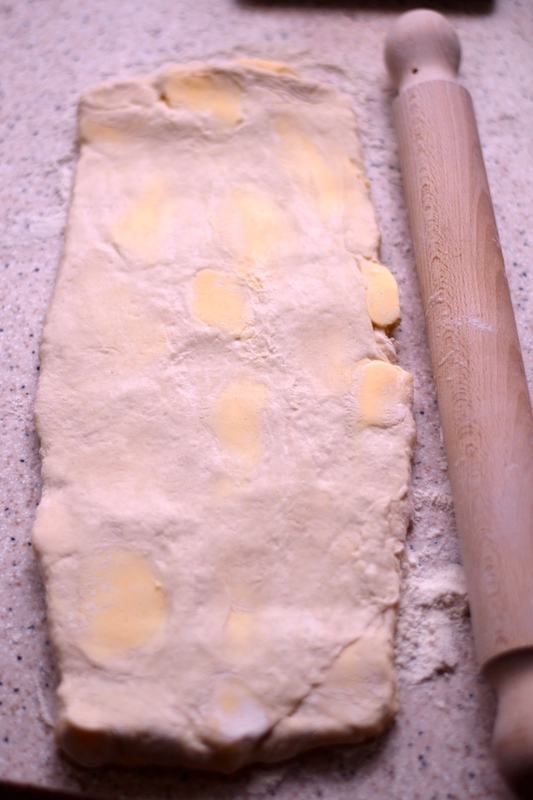 After the final rolling out and folding, place your pastry back into cling film and back in the fridge, this time for at least 30 minutes (the trick to puff pastry is keeping the butter cold). You can now leave your pastry in the fridge until you’re ready to use it, if it’s longer than 30 minutes it won’t matter. 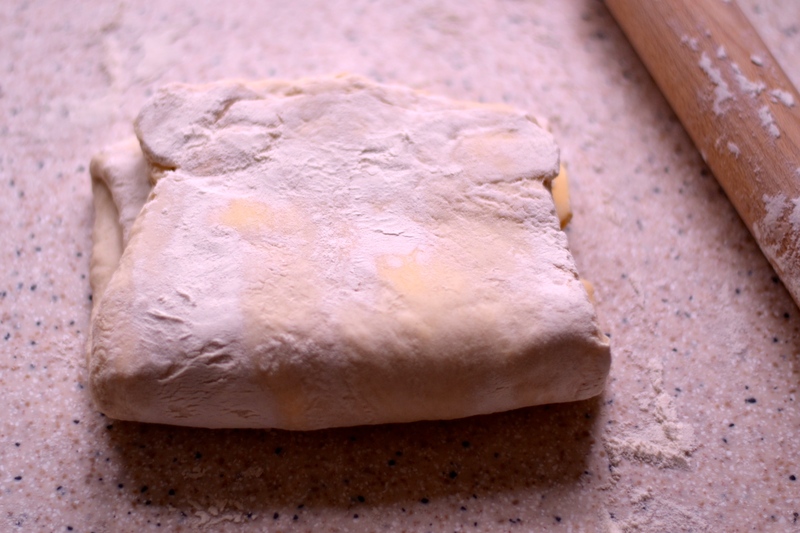 Once you’re ready to use your pastry, take it out of the fridge and use it like you would a shop-bought block of puff pastry. So, have I convinced you? Is that not super easy? A little bit of faffing about, but like I said, most of the time is spent with the pastry sitting in the fridge so you could be doing whatever else takes your fancy in the meantime. 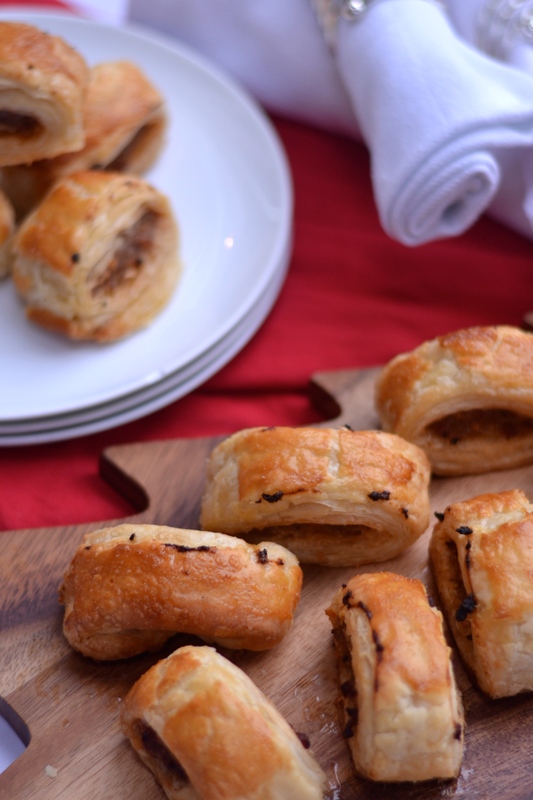 Homemade Sausage Rolls – You haven’t had a sausage roll until you’ve had a homemade sausage roll! 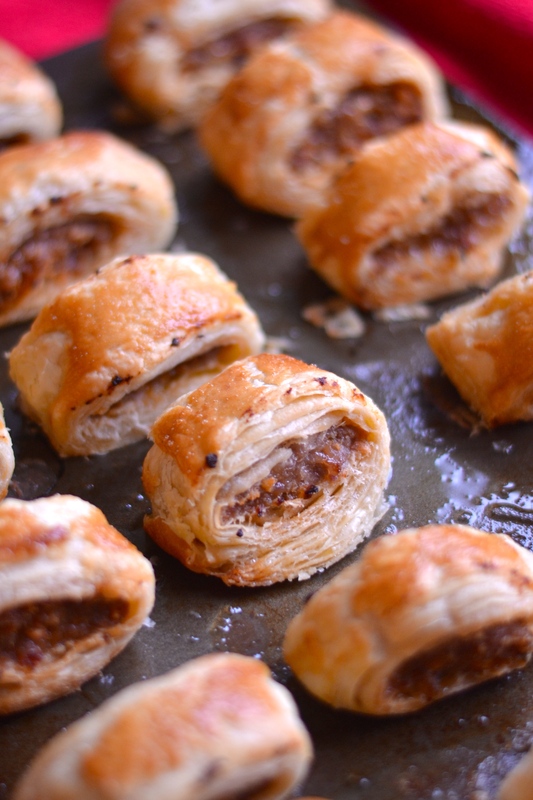 I always make sausage rolls at Christmas. 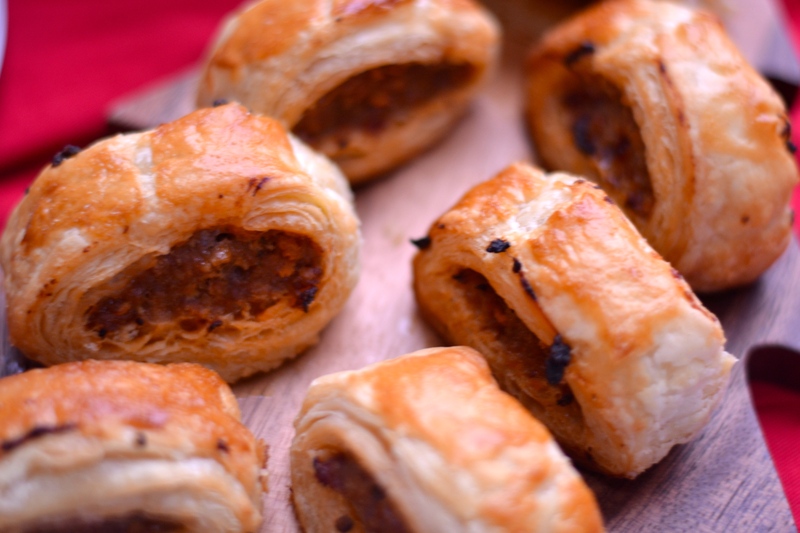 I don’t know if it’s just me, but to me sausage rolls mean Christmas. We tend to have them on the big day itself, either as a light lunch or a late supper, depending on when we have the main event (this has changed over the years from early afternoon to dinner time – I like it later as it gives me the whole day to prep/eat/drink – I once drank a whole bottle of prosecco whilst making Christmas dinner….but I digress). 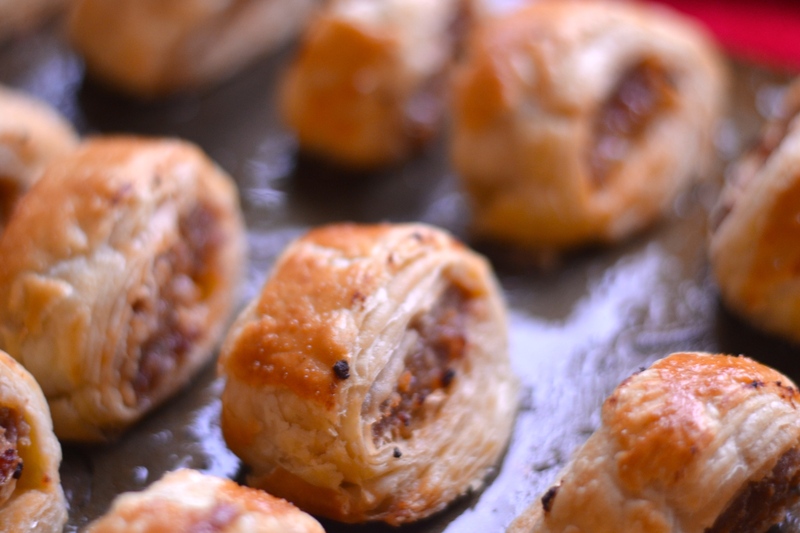 You get some lovely shop-bought sausage rolls, but if you’ve never made your own, you’re honestly missing out. These are really tasty, and really simple. Let’s talk pastry. I usually buy the shop stuff. It’s good; it’s easy; it’s convenient. 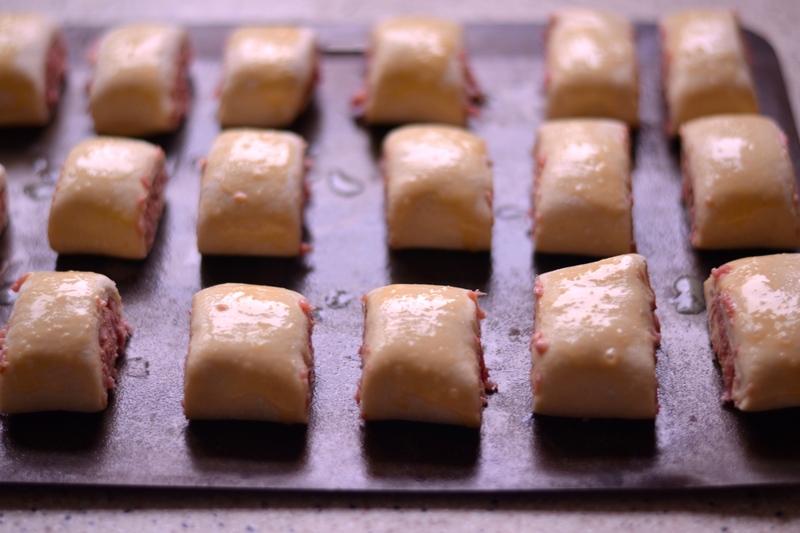 Nine times out of ten, I’ll use a nice block of shop-bought puff pastry. However. During a rather enthusiastic baking spell a few years back, I decided to make my own. How hard could it be? The answer is actually not hard at all. Don’t go believing the theatrics of GBBO. Making puff pastry is not particularly hard. It does take a bit of time, but most of that is to chill the pastry. 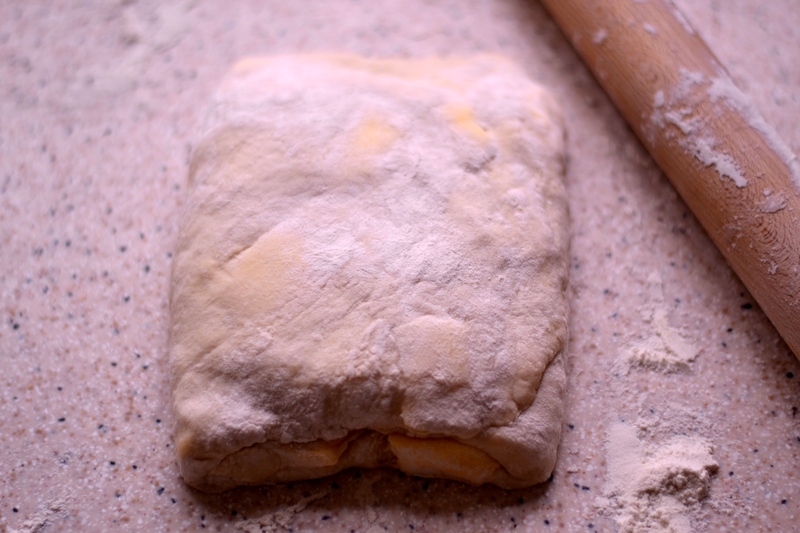 So I’ve written a separate post here about making puff pastry. However, if you can’t be bothered with that just use a block from the shop. Quantity of sausage meat is not exact because different shops sell it in different sized packs, so use whatever you have between those quantities (mine was 400g on this occasion). The last ingredient is totally your call. 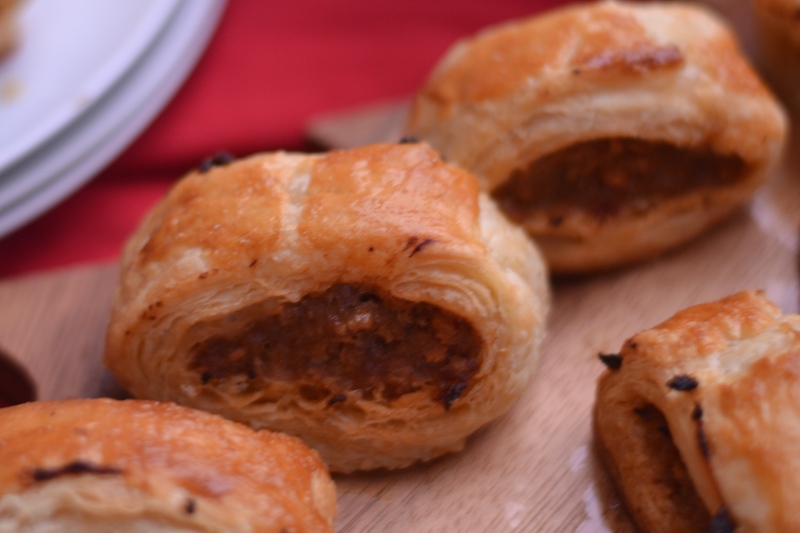 Sometimes I like some extra flavour to my sausage rolls, sometimes I just like to leave them traditional. 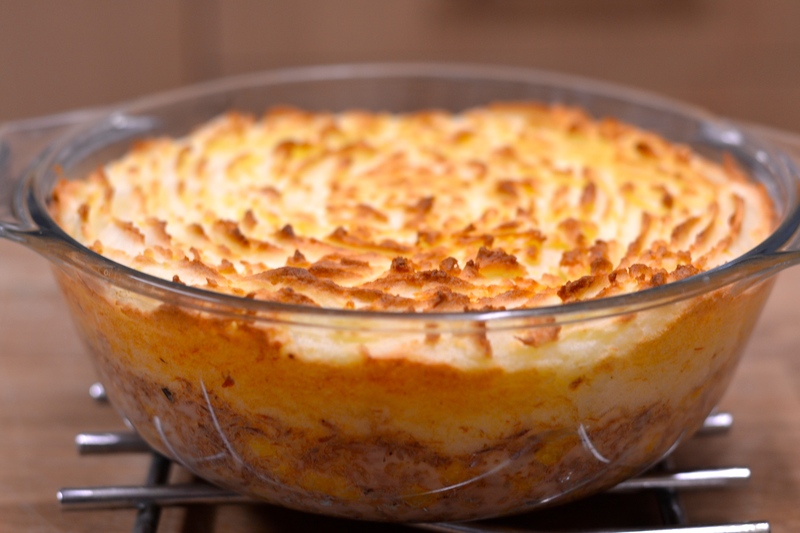 You could even split the filling and add extra flavour to one portion whilst leaving a portion plain. The choice is yours (on this occasion I added 2 tbsp of ketchup – saves having to dunk them once they’re made). 1. Preheat your oven to 200°C (fan) / 425°F / Gas 7. 2. In a large bowl mix the filling ingredients together with your hands. Season well. 3. 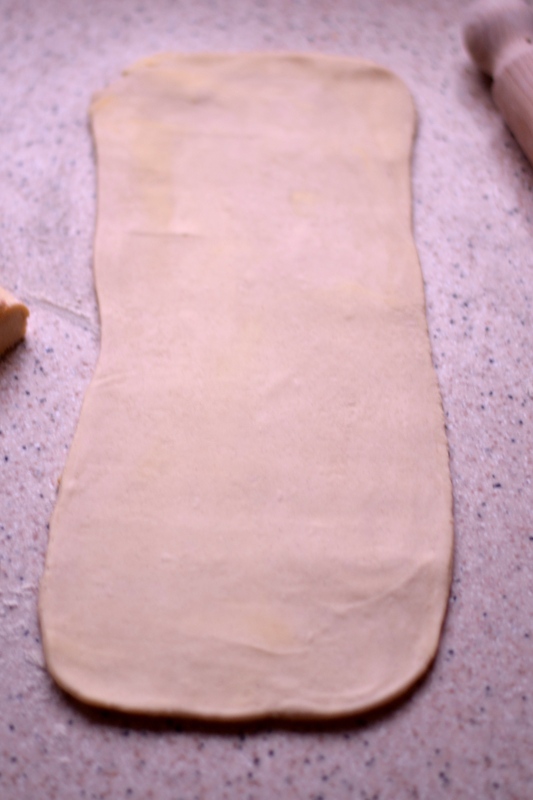 Take your pastry out of the fridge. 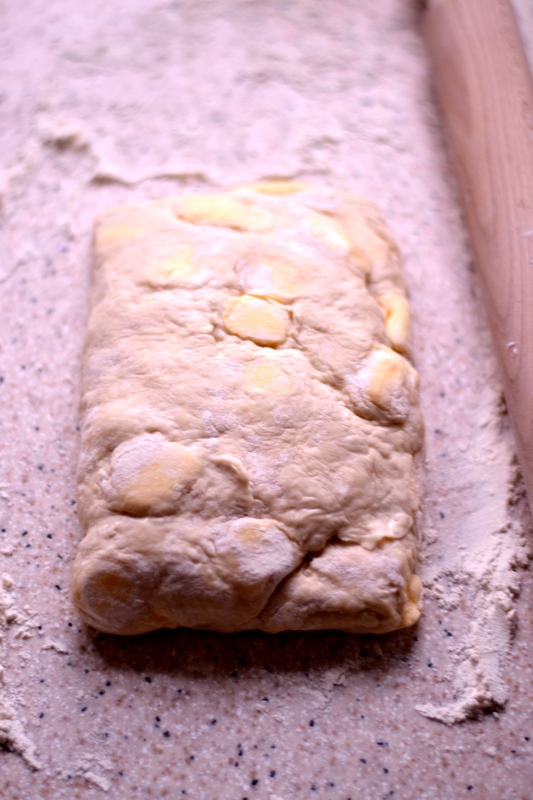 Cut it in half, and roll the first half out on a lightly floured surface to about a 42x10cm rectangle. 4. 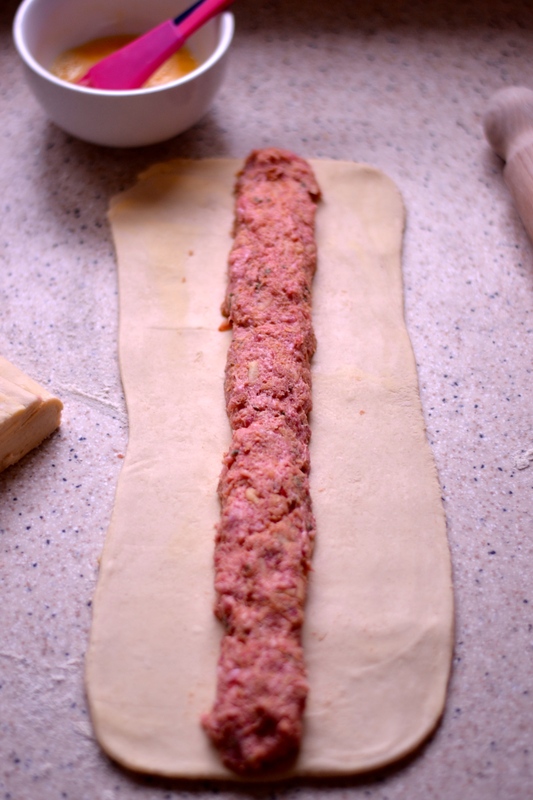 Take half of your filling and squeeze it out into a long log shape, placing it in the middle of your pastry strip. 5. Brush both long edges with the beaten egg, then fold one side over, followed by the second side, and seal well. 6. Turn the long roll over so the sealed edge is underneath, and place on a tray. 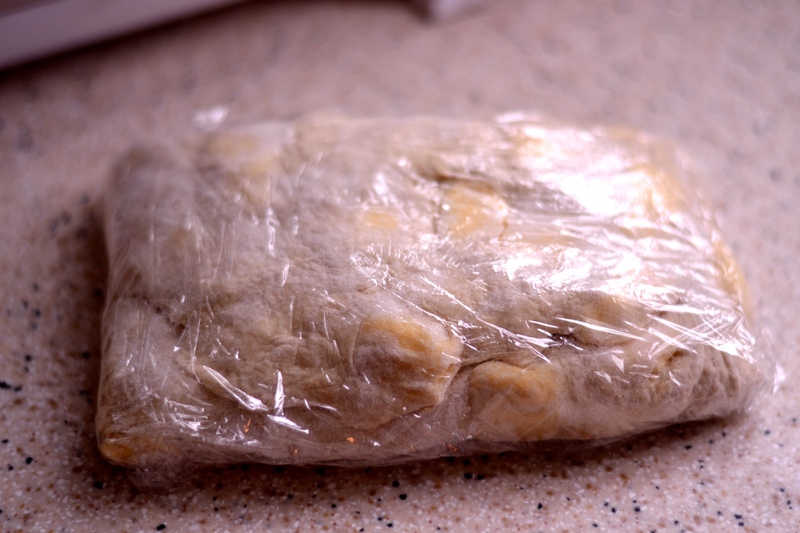 Repeat the process for the second roll, then place the tray in the fridge for about 10 minutes to chill. 7. 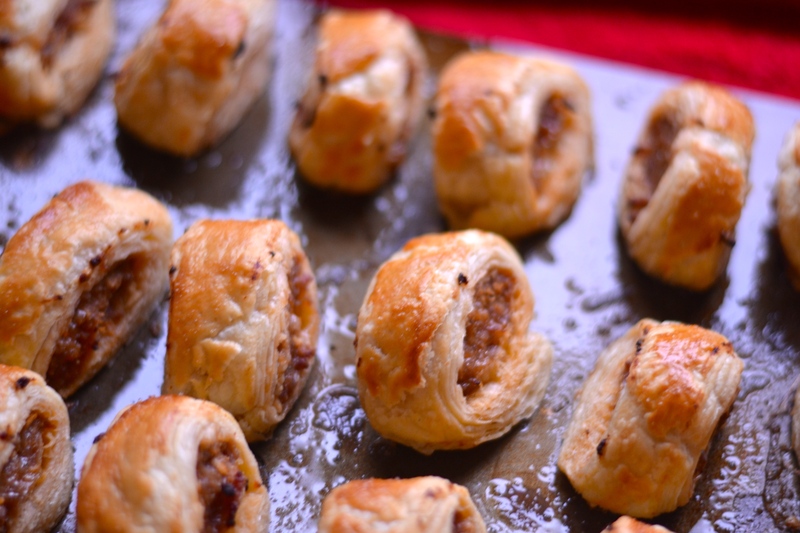 Take out of the fridge and cut each into about 12 pieces (or whatever size you like for your sausage rolls). Space out on your baking tray (I tend to spray my tray with cooking oil before placing the sausage rolls on it to prevent them sticking) and brush each roll with the beaten egg. 8. Bake in the preheated oven for 20-25 minutes until golden and cooked through. If you can resist eating about 5 of these straight out of the oven then you’re a better person than me! After cutting them up and brushing with the egg (step 7), place them on a tray, slightly spaced apart, then place them in the freezer for about an hour. No need to cover. Once they’re frozen take them out and pop them in a freezer bag, seal and place the bag back in the freezer until you need them. When you want to cook them, place them on a tray and pop in the oven (same temps) for 30-35 minutes until golden and cooked through. No need to egg wash as you’ve already done this. Easy! 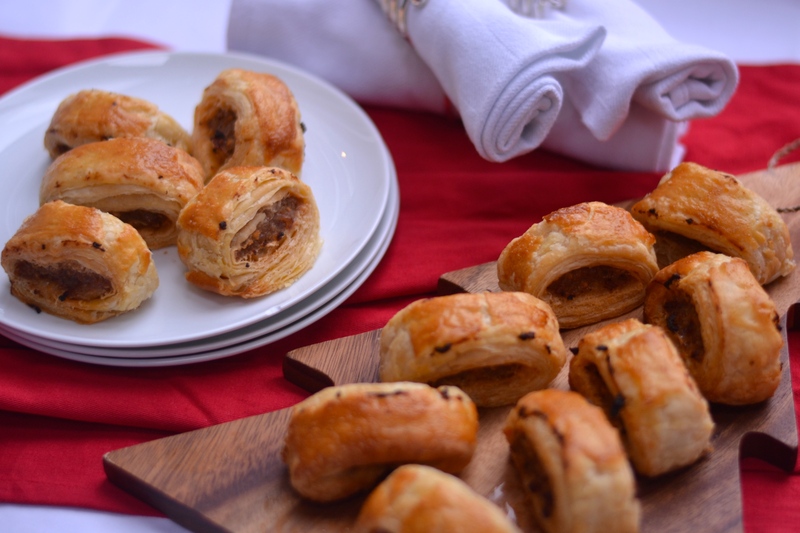 If you’ve got a Christmas party this year that you need to take a nibble to, make some of these, and I promise they will go down well. The Hectic Cook Create a free website or blog at WordPress.com.